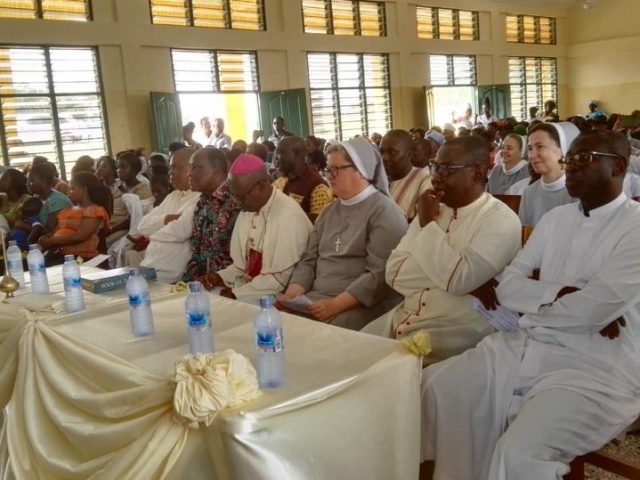 Mother Jana, Sisters Helen and Daniela were among the special guests at the blessing of Stage 2 of Holy Family School Yamfo. 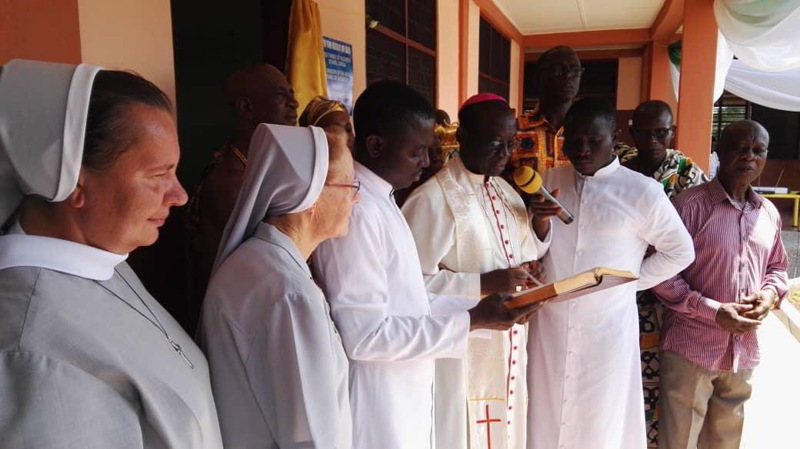 In his address Most Reverend Peter Atuahene, Bishop of Goaso Diocese thanked M. Jana and the Sisters for the sacrifices made for the sake of this mission. 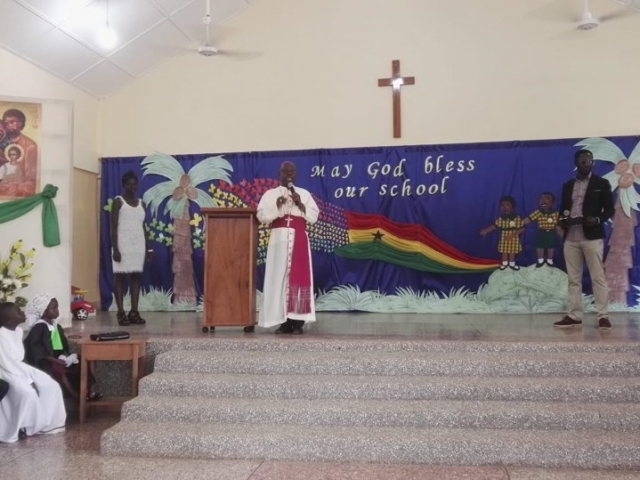 Mr. Alfred Dapilah, the Supervisor of Private Schools in the Tanoso District, congratulated the school for its achievements and its standing as a model A Grade School in the region. 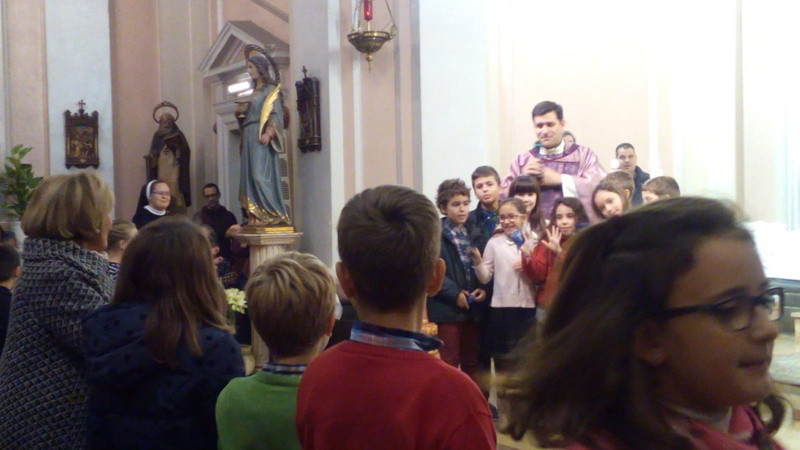 The performances of the children were enjoyed by all. 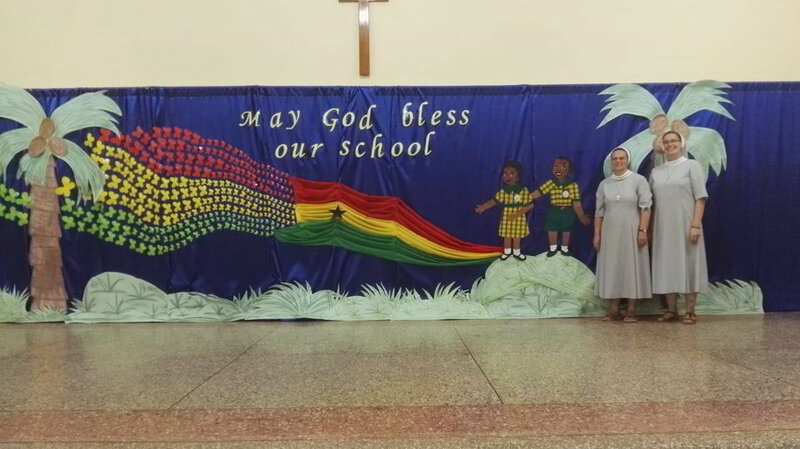 The musical and dance numbers presented captured the unique culture of Ghana as well as the Christian spirit of the school. 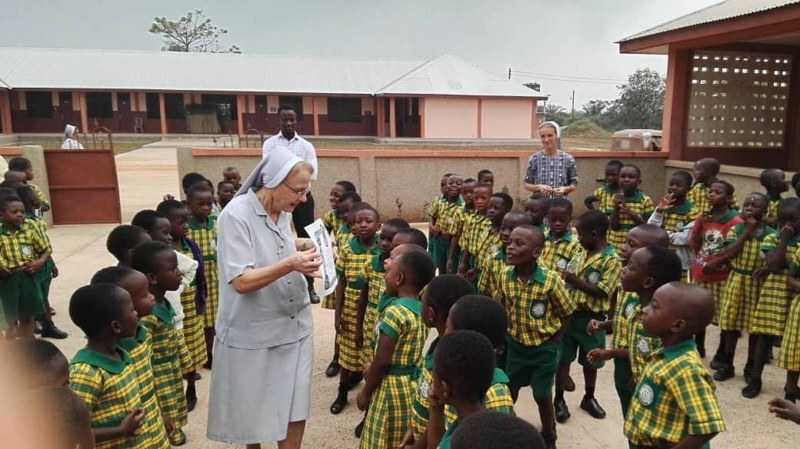 Mother Jana recalled the beginnings of the school and its growth, not only of the buildings but more especially the growth and development of the students. 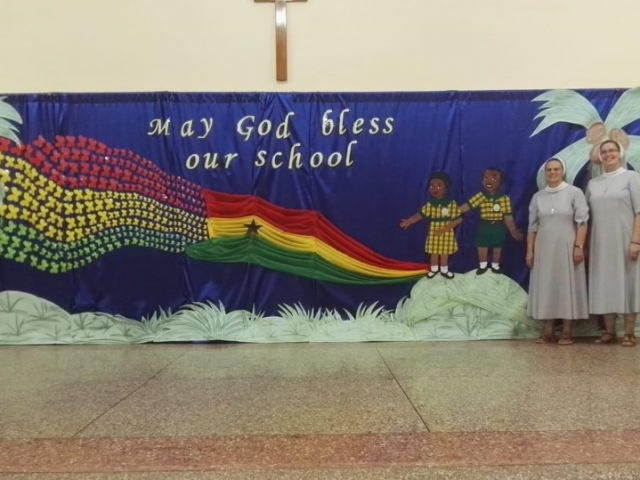 Sr. Angelina and her staff are to be commended for their hard work and commitment to the school. From December 3 to 19, 2018, I was able to visit our Spanish mission in Benicassim. Only two months have passed since our arrival, and a lot has happened and continues to happen. Here are a few of the joys that we would like to share with others. 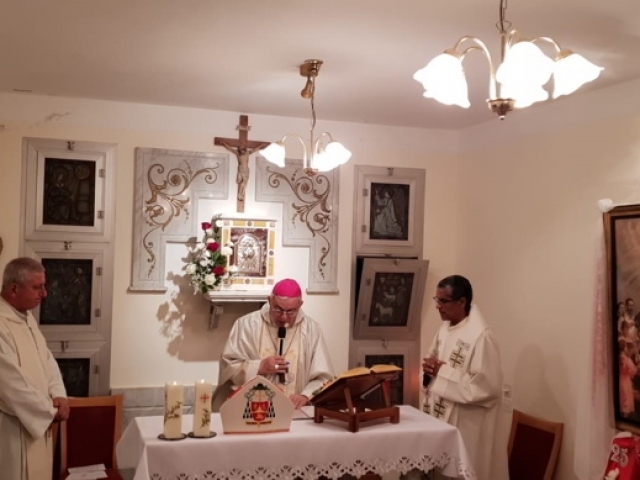 In the evening of December 7, Mass was celebrated in the large chapel of our house, presided over by Bishop Casimiro Lopez. 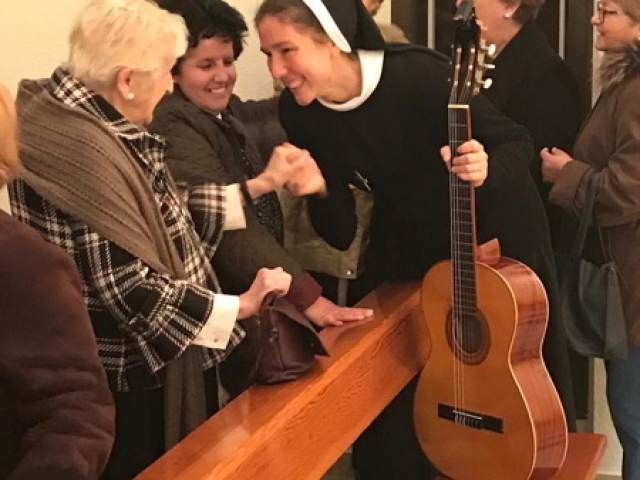 From that moment on, it is here that we fulfill our most important apostolate in the diocese, that is, we pray for families and with families. 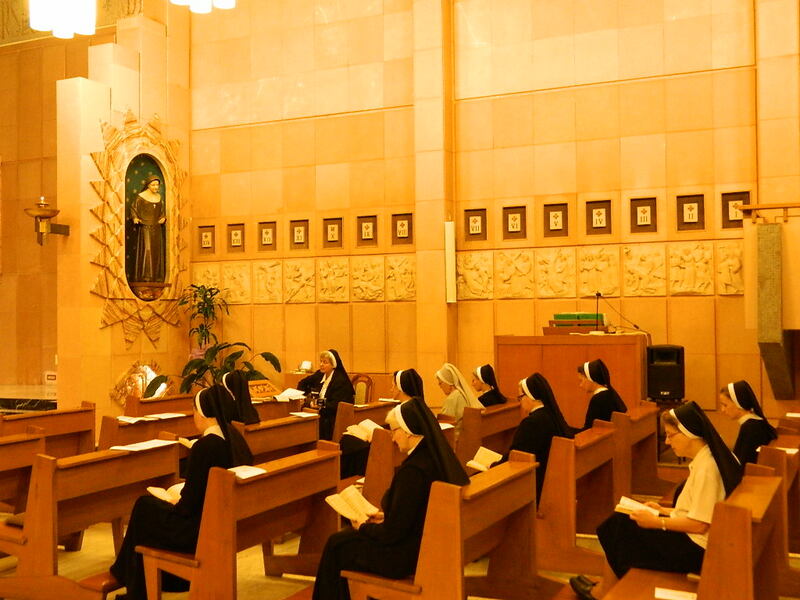 Meanwhile, twice a week in the afternoons (on Wednesdays and Sundays), the Sisters remain several hours for adoration. 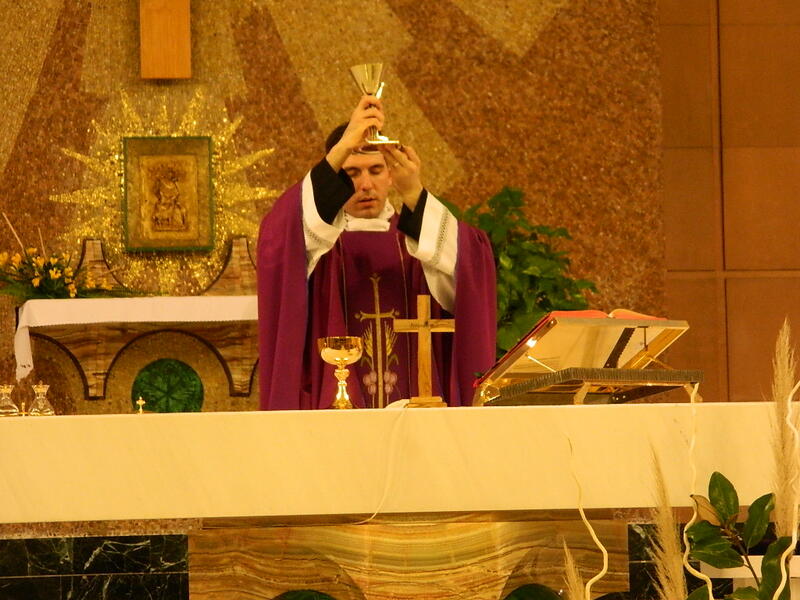 Additionally on Wednesdays, there is a Mass at 9:00pm, always for families. 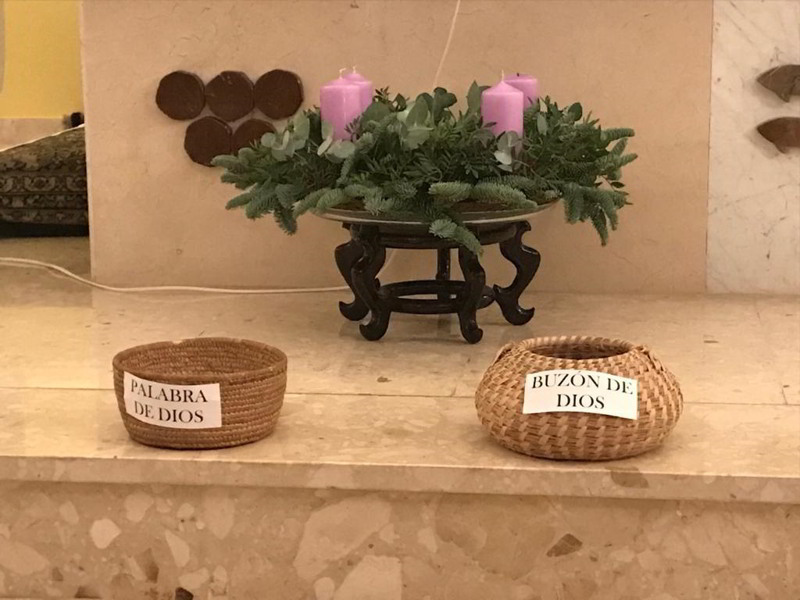 The rosary, the prayer and litany to the Holy Family are prayed, the canons are sung, there is a time of silence, listening to the Word, putting intentions into the “mailbox of God” …. 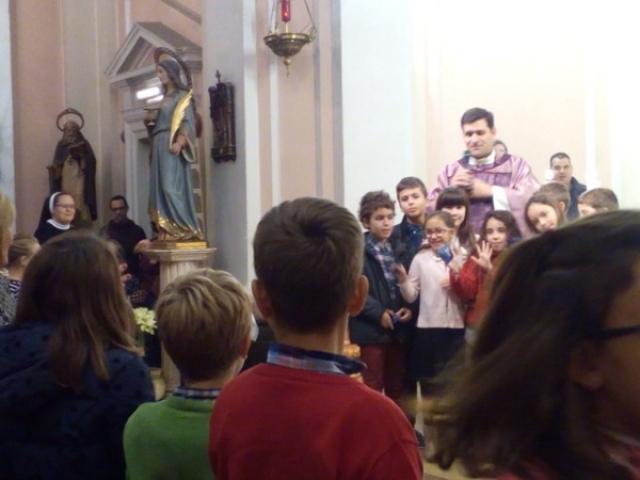 I can testify that we were not alone in the chapel for a moment. What’s more, different groups have already declared their willingness to come to our chapel to pray with the Sisters. This will be the case, for example, during New Year’s Eve. 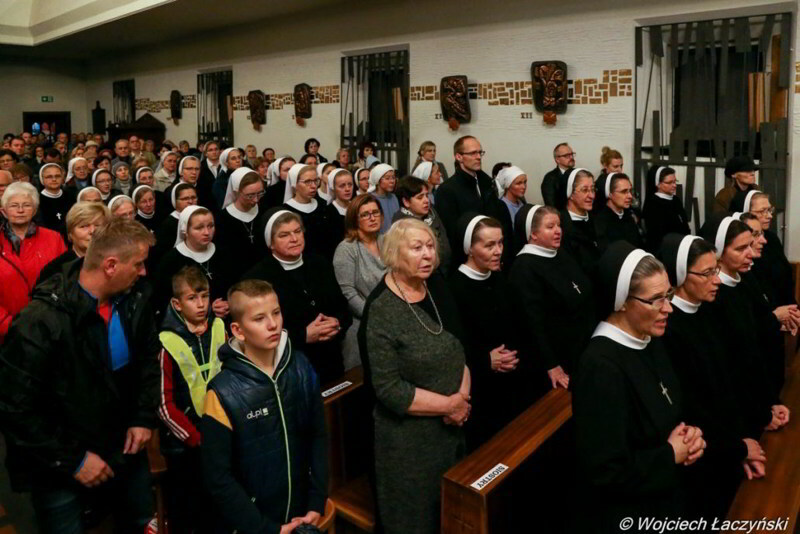 On December 12, during the Mass, the relics of Blessed Frances Siedliska and the 11 Martyred Sisters of Nowogródek were introduced. 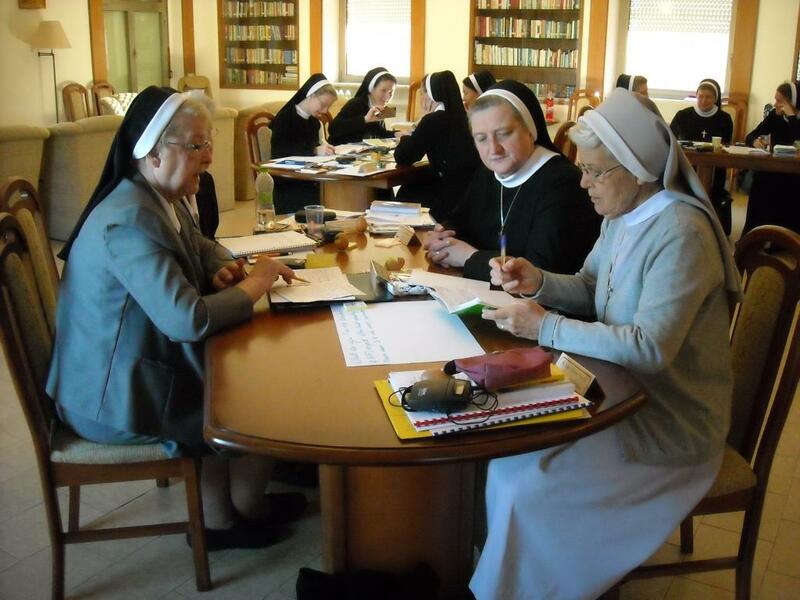 More and more, the Sisters participate in the life of the parish and diocese. 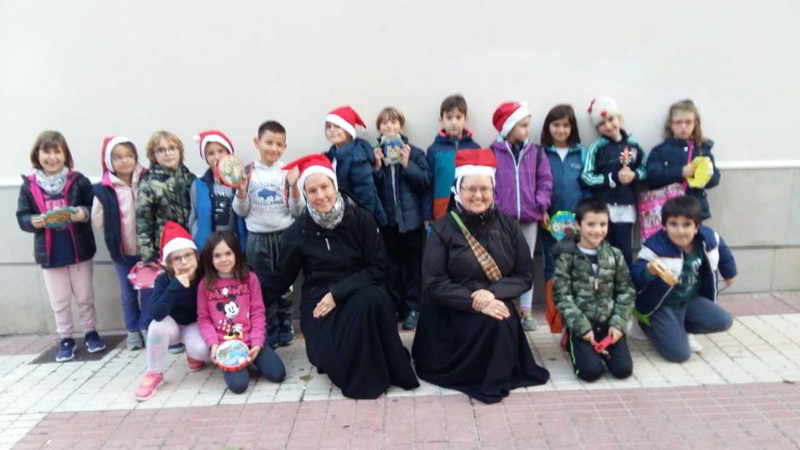 They are with the catechists and children in the parish catechetical program, at the Masses for children (for example in the musical group animating the liturgy), in the parish Caritas group. 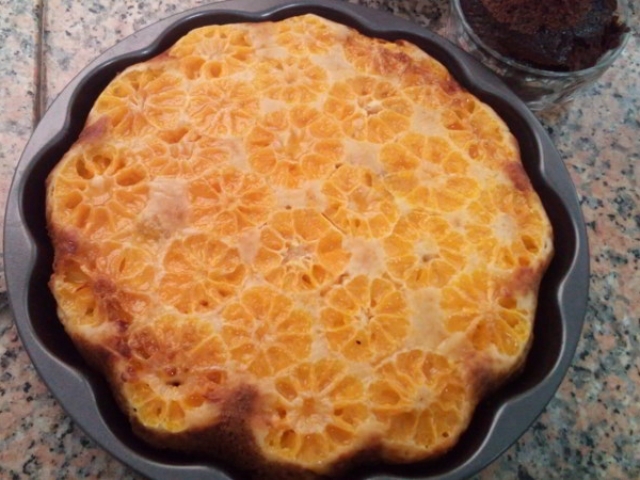 Our house is constantly visited, for a moment of conversation or in order to share something with the Sisters, for example, furniture (… because our house is not yet fully furnished), or tasty fruit (now is the season for mandarins and oranges). The Sisters are also happy to participate in various special events. 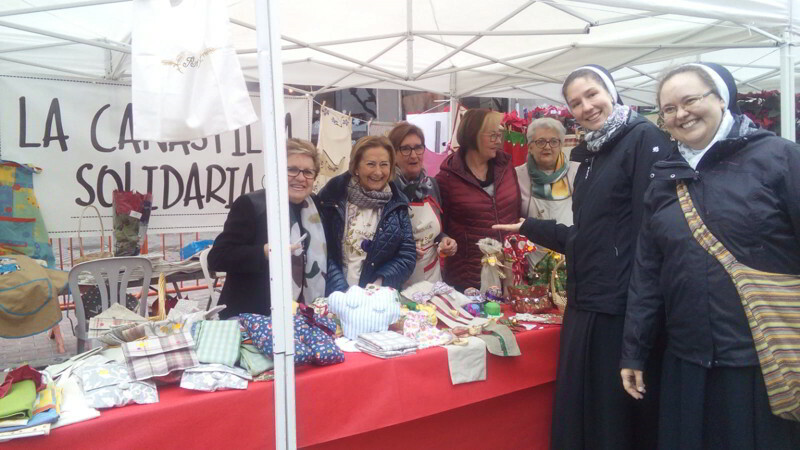 During my stay, we helped in the preparation and organization of the Christmas Fair, which took place on Gaudete Sunday. 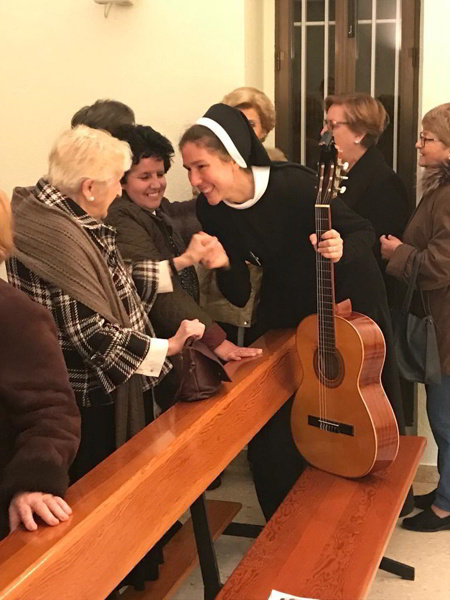 Truly, it was joyful! 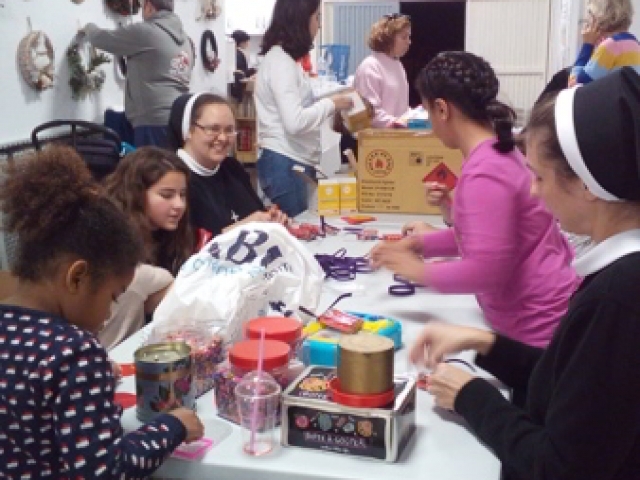 Every year, the income from this initiative is dedicated to a different charitable endeavor. 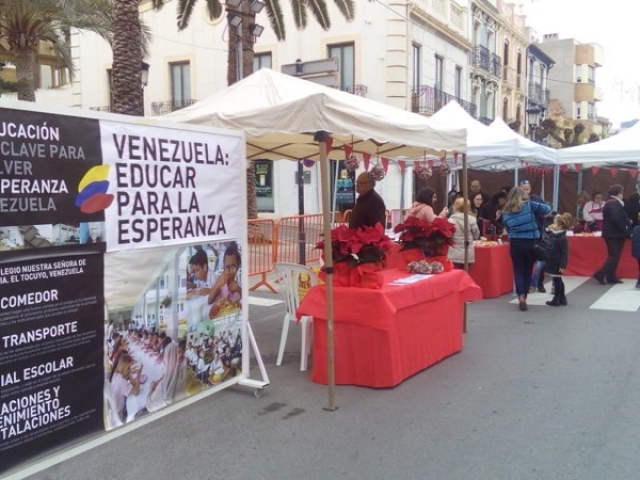 This year, the income was used to support one of the schools in Venezuela. 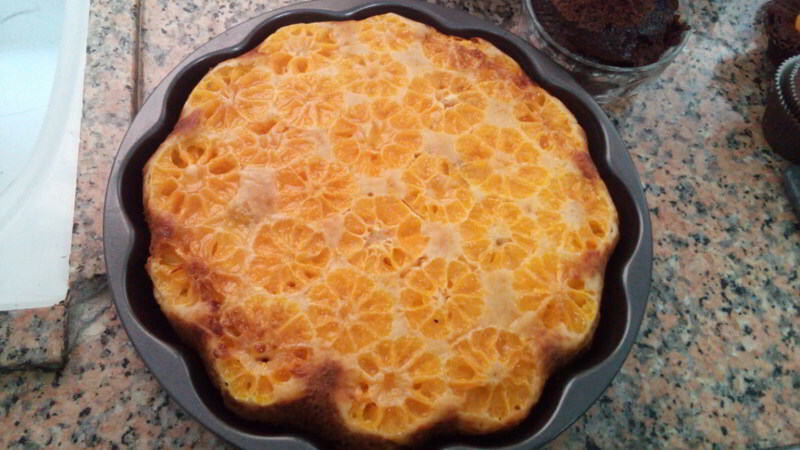 We had our own contribution in the form of baked cakes. In the diocese, there are various initiatives for the family, for protection of the unborn, help for single mothers, etc. We are slowly getting to know the people connected with these apostolates, making different contacts, recognizing our specific place and the tasks that we can take on. 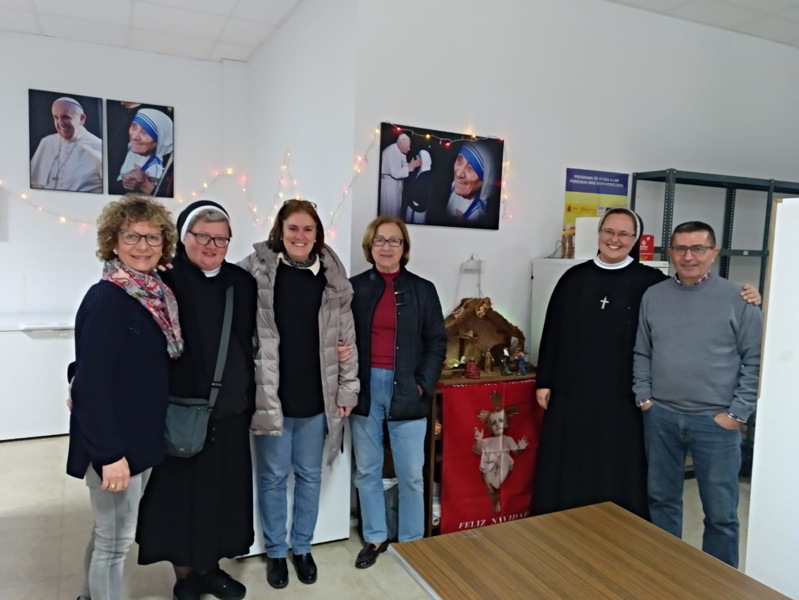 Together with the local Superior, Sister Katarzyna, we participated in a diocesan meeting on the subject of pastoral care of families. Over 30 people were gathered. 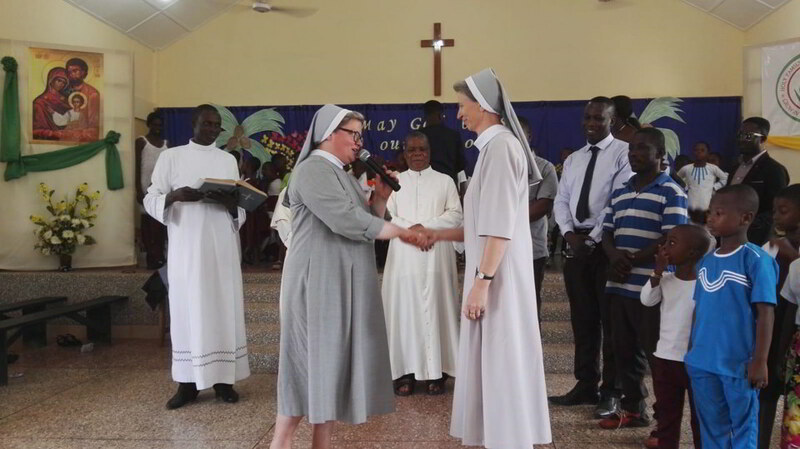 I really admired their commitment, professionalism, enthusiasm and faith. 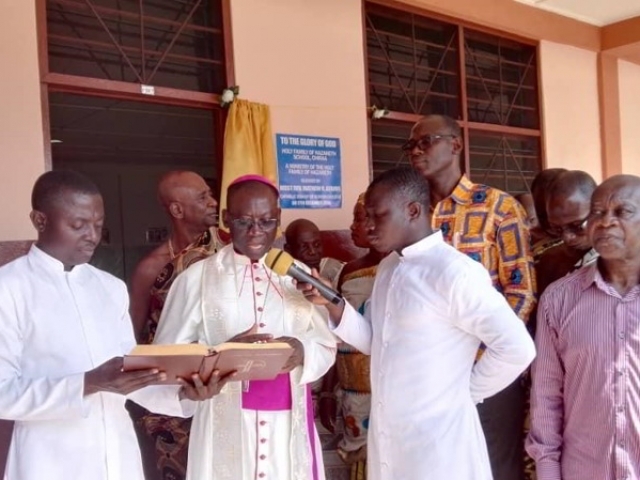 The group was led by lay people (some connected with various ecclesial movements), and there were also some priests present. 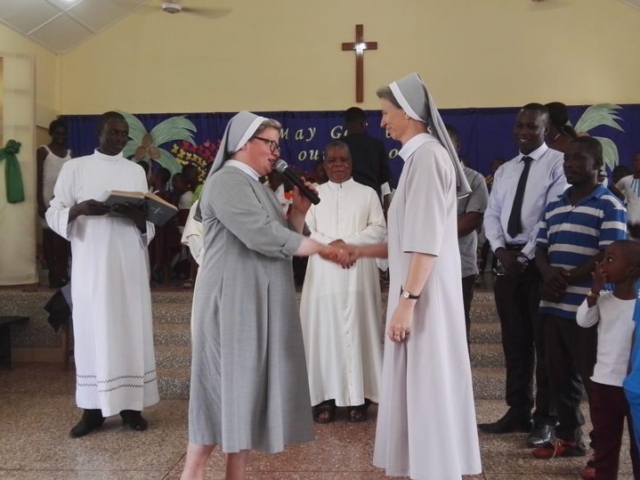 We were the only Sisters, but we felt very well accepted and even intimidated by the hopes placed in us as Nazareth Sisters, in our mission and charism. 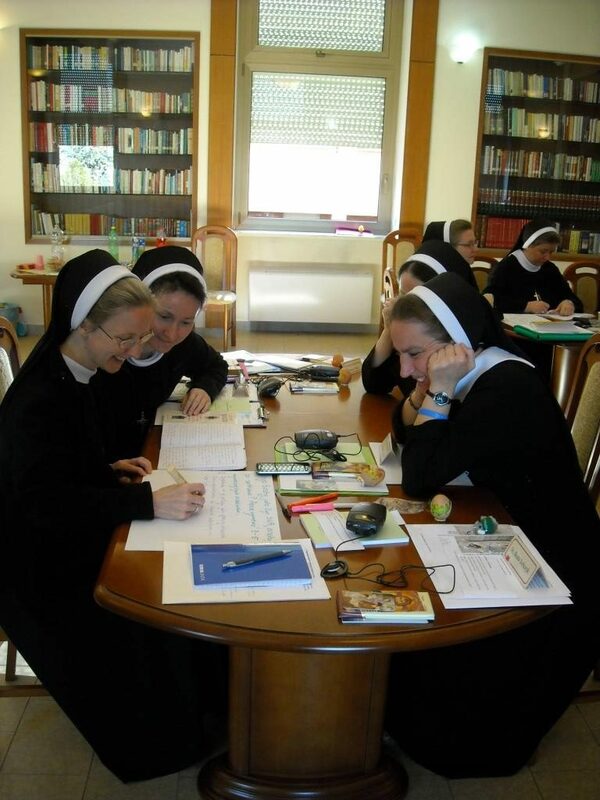 Of course, the Sisters are still improving their language skills, learning new customs, traditions. And although the heart would already want to be doing something more, the realities of everyday life teach the humble path of small steps … The most important thing is to go in the right direction! 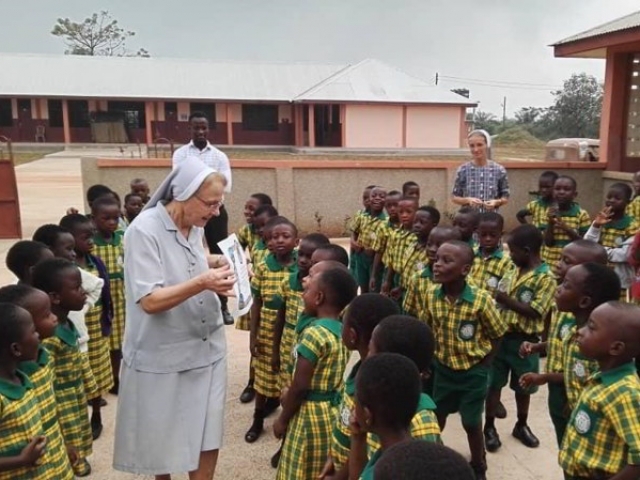 On Monday 17 December, 2018, the Holy Family of Nazareth school community in Chiraa, Ghana had much cause to rejoice!!! 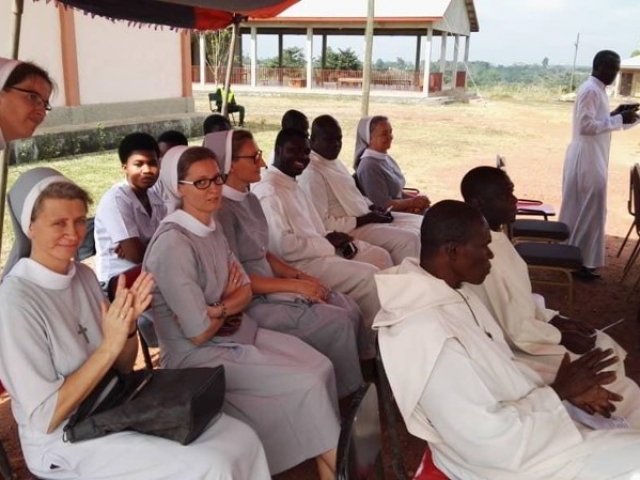 In the presence of Sr Helen Tereba, the local chief of Chiraa Berima Mensa Afari, Sister Justyna, headmistress, Sisters, Invited Guests, parents and students, Most Rev. 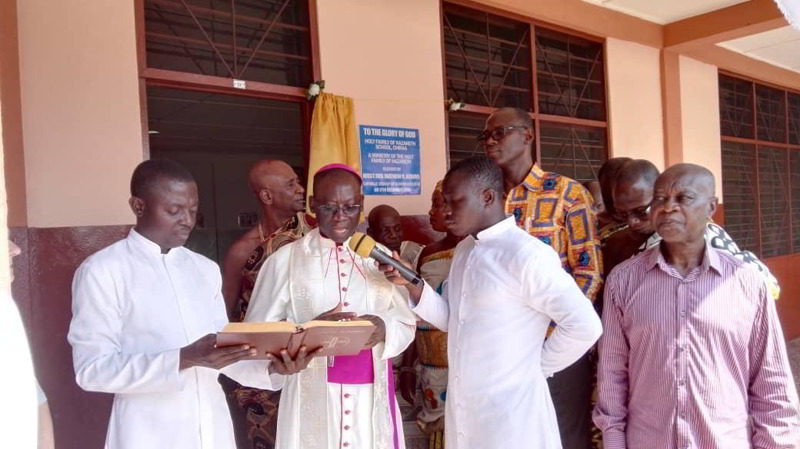 Matthew Gyamfi, Bishop of Sunyani Diocese blessed stage two of the recently completed school building for the primary students. 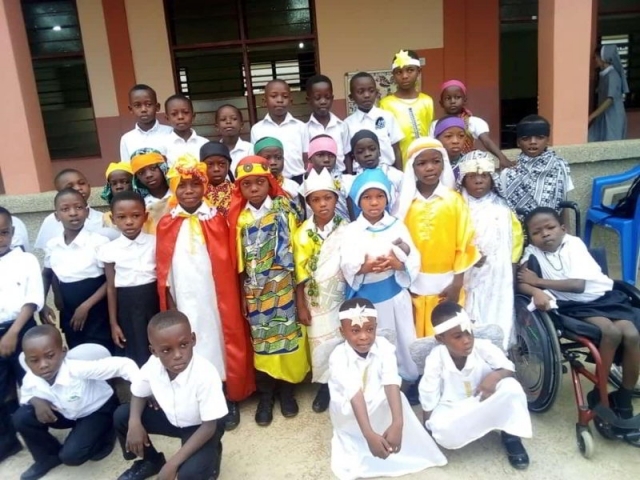 The teachers and students are to be congratulated on the special performances, which each class prepared for the day’s program. 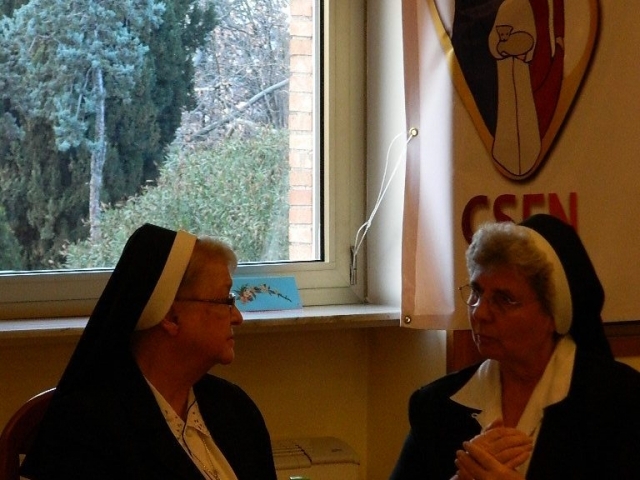 On November 23, 2018, Sr. Beata Rudzińska, General Secretary/Councilor and Sr. Angela Marie Mazzeo, General Councilor, participated in the 25th Silver Jubilee of Religious Life of Sr. Speranza Grzebielec. 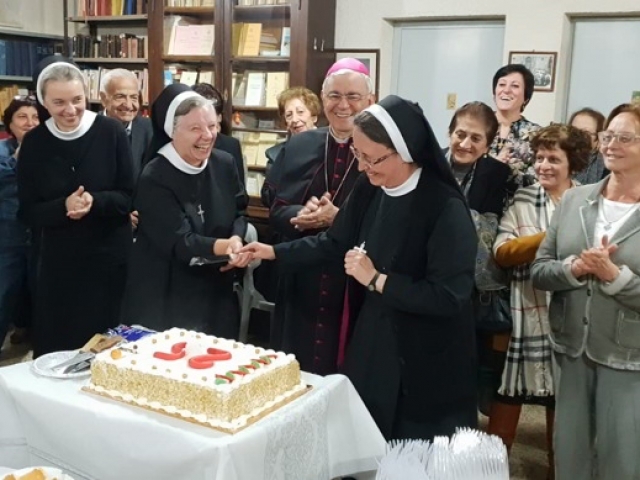 This celebration took place in Nazareth, Israel where Sr. Speranza has been ministering for many years. 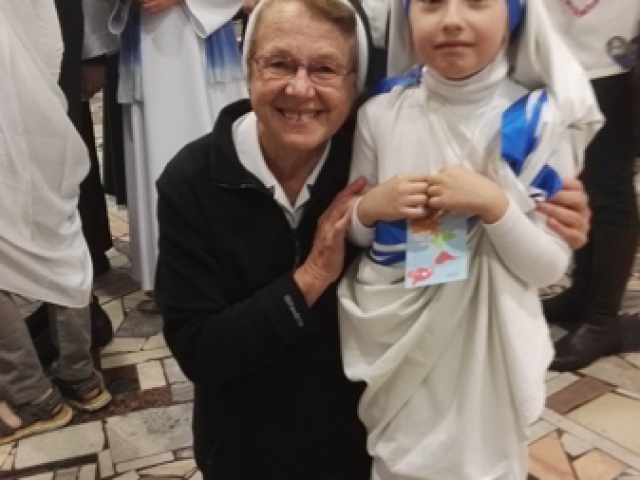 The date for the Jubilee celebration was specifically chosen to closely coincide with the celebration of the Feastday of our Mother Foundress, Blessed Mary of Jesus the Good Shepherd. 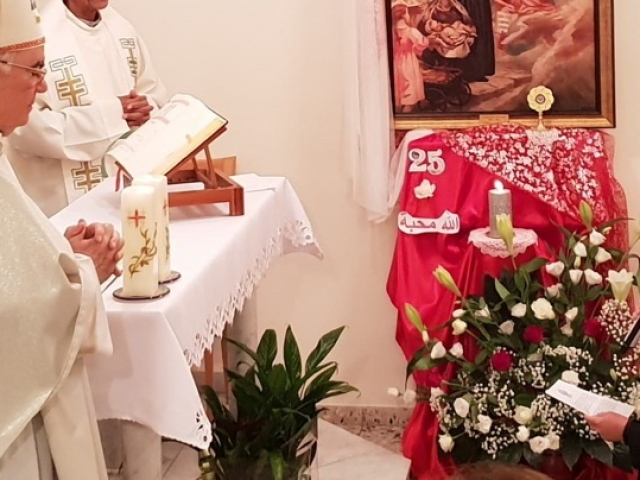 The Jubilee Mass was celebrated by Bishop Giacinto-Boulos Marcuzzo, the current Latin Patriarchal Vicar of Jerusalem and Palestine. 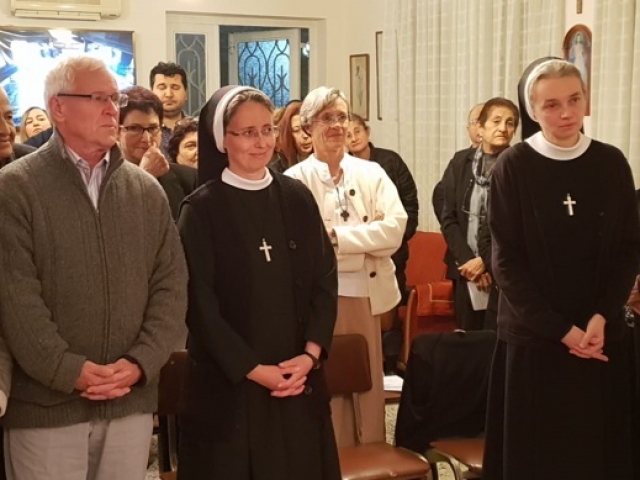 Bishop Marcuzzo who previously served as the Patriarchal Vicar in Nazareth is a long-time friend of the Congregation and especially of the Sisters serving in Nazareth. 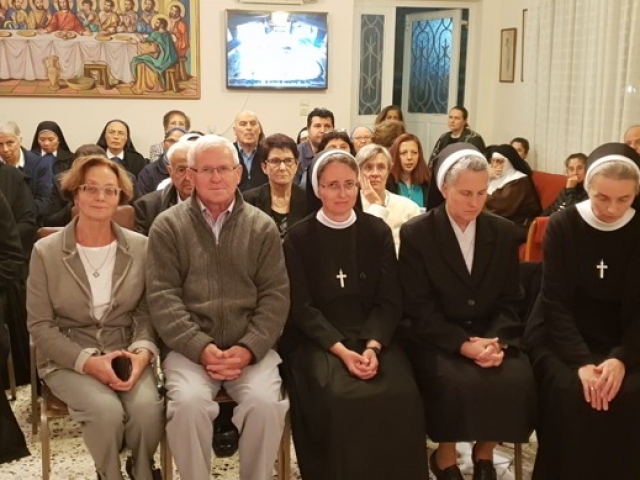 Joining in the festivities were Sr. Speranza’s parents who had traveled to the Holy Land for this special occasion, as well as good number of invited guests, including priests, Religious Brothers and Sisters from other Congregations and many lay persons with whom the Sisters come in contact in their daily ministry. A number of years ago, the Sisters started invited members of other Congregations to participate in our Foundress’ feastday. 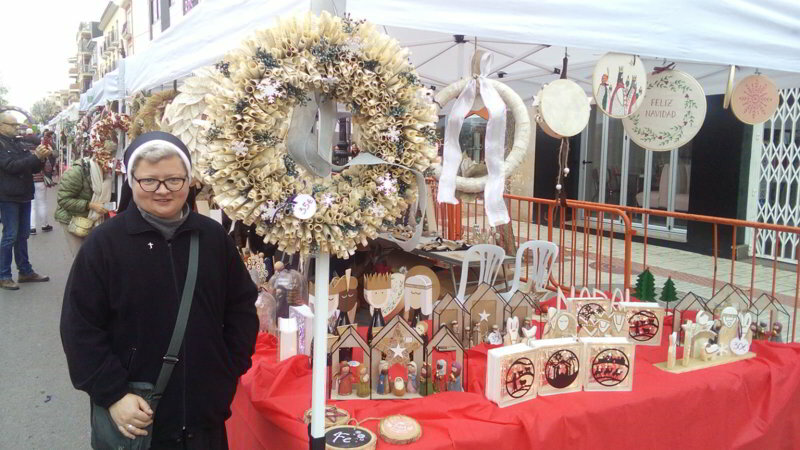 Each year the celebration has grown. 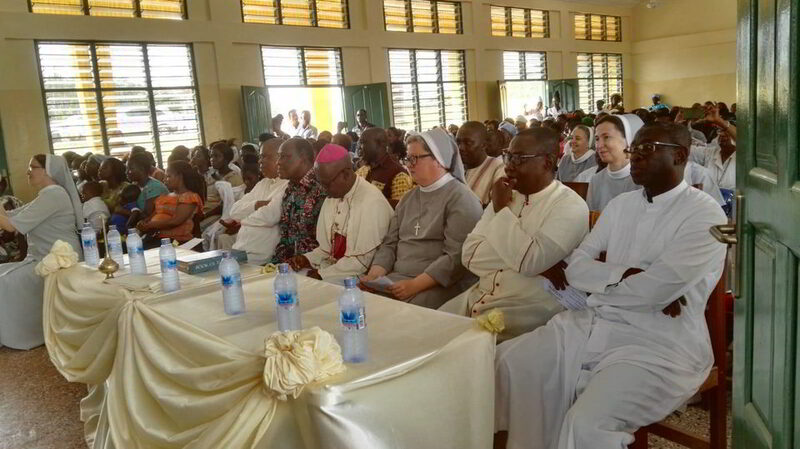 This year, the crowd gathered was even larger due to the occasion of Sister’s Jubilee. 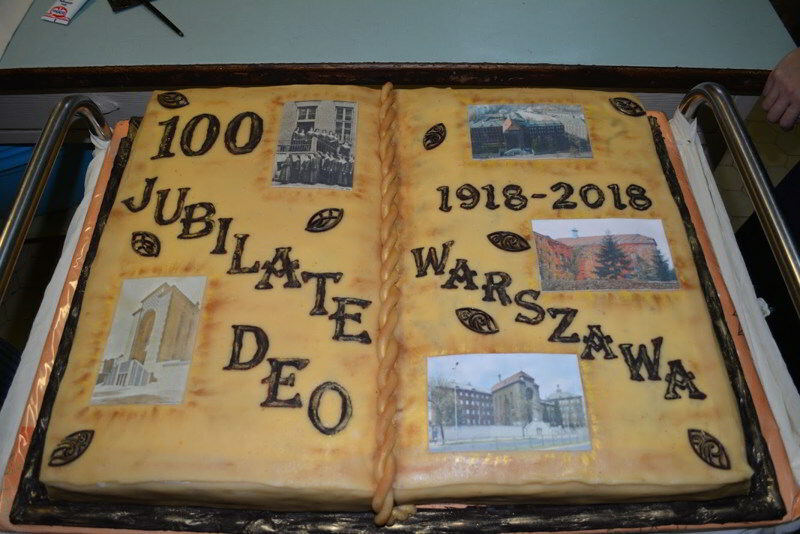 After the liturgy, everyone was invited to partake in some refreshments and the decorative and tasty Jubilee cake. 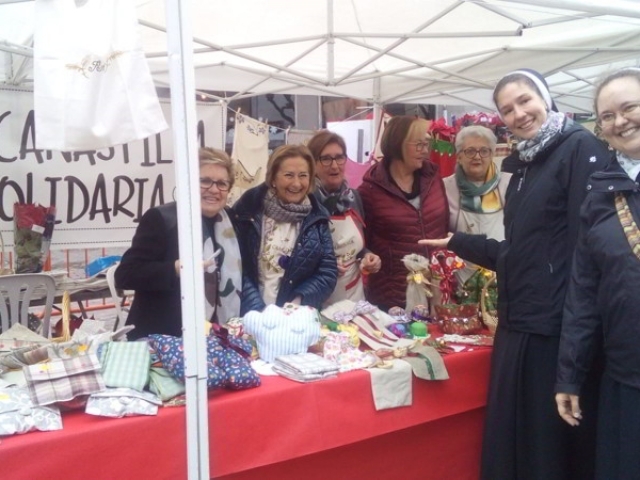 In the crowd gathered, you could hear many languages – English, Italian, Polish, Arabic, French, etc. 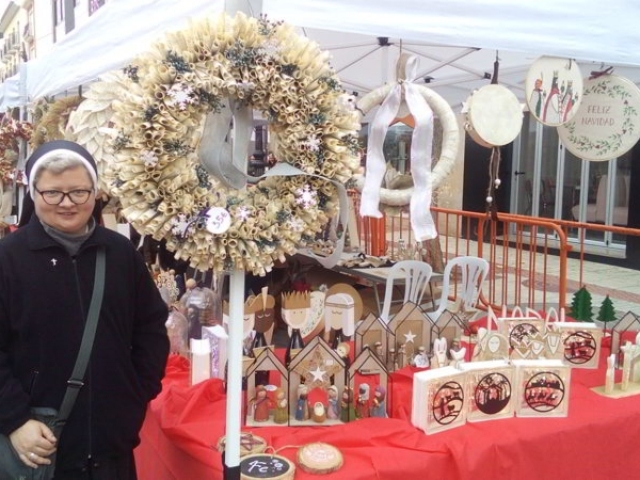 But what was most notable was the spirit of unity and joy that was present. 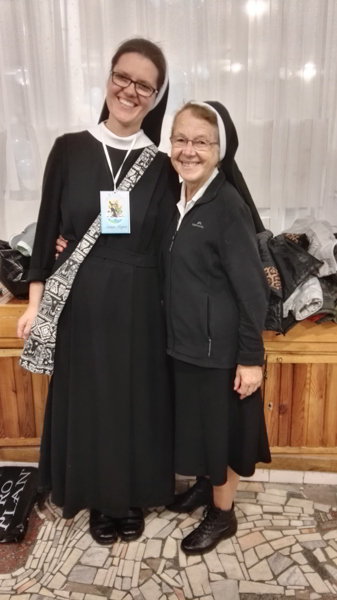 It was a true blessing for me to accompany Mother Jana to Belarus from 9 – 19 November, 2018. 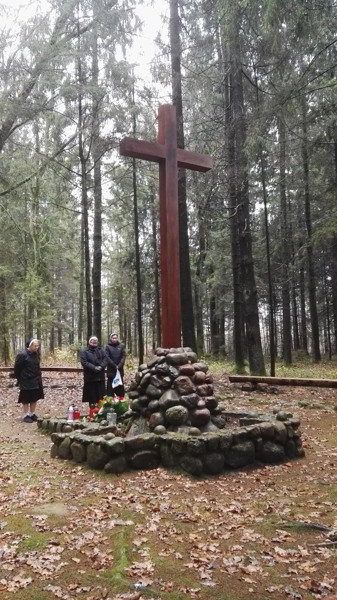 True, this was my second visit to Belarus, the first being about 20 years ago. 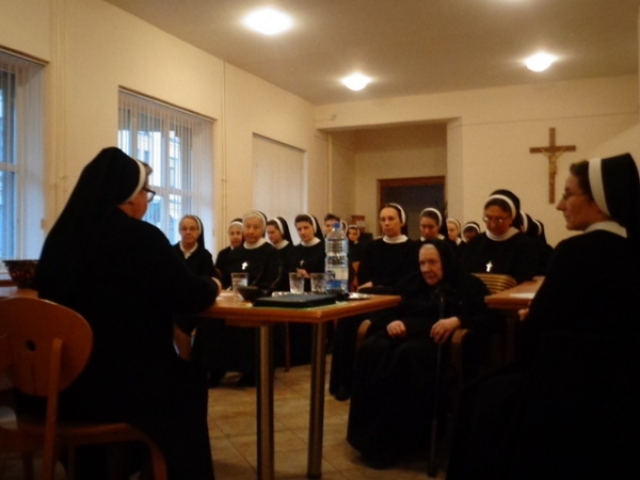 The main purpose of our visit was to meet with all the Sisters in the province, the first meeting in Grodno and the second in Nowogródek. 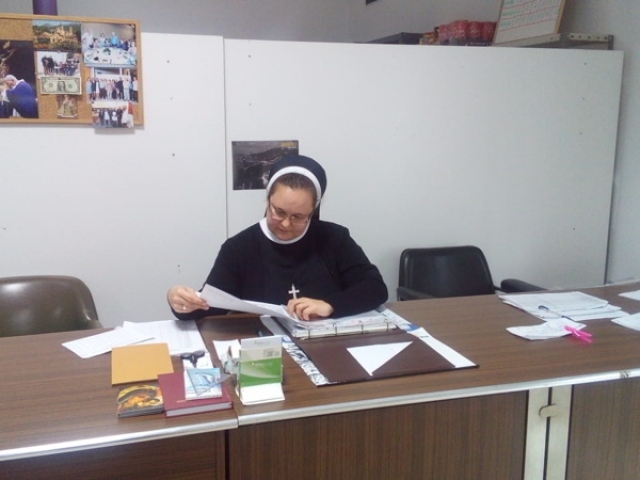 Nevertheless, Sister Maria Błaszczyk, Provincial Superior, very kindly arranged that we should visit every convent which she claimed was “on the way” from Minsk, to Grodno to Nowogródek and then back to Minsk for our departure to Rome. 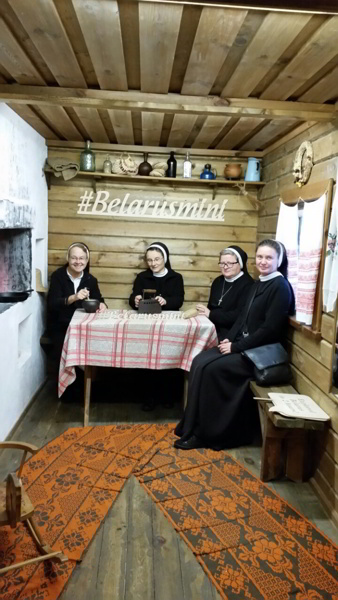 Devotion to our Blessed Martyred Sisters has spread far and wide not only in Belarus but also throughout the world. 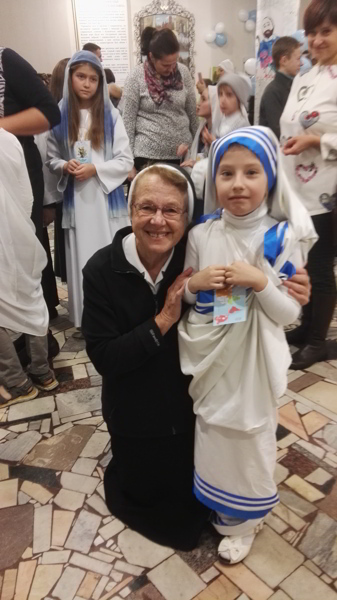 This was evident, for example in the Parish of St John the Evangelist and St Maximilian Kolbe Parish, Minsk where the celebration for the feast of All Saints includes an All Saints Ball for young and old. 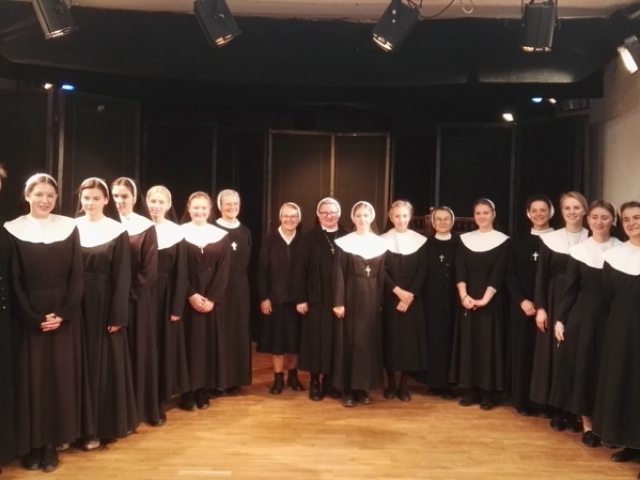 This year’s program included a drama presentation prepared by Sister Sister Klara Wołczek on our Martyred Sisters with a particular focus on Sister Canuta. 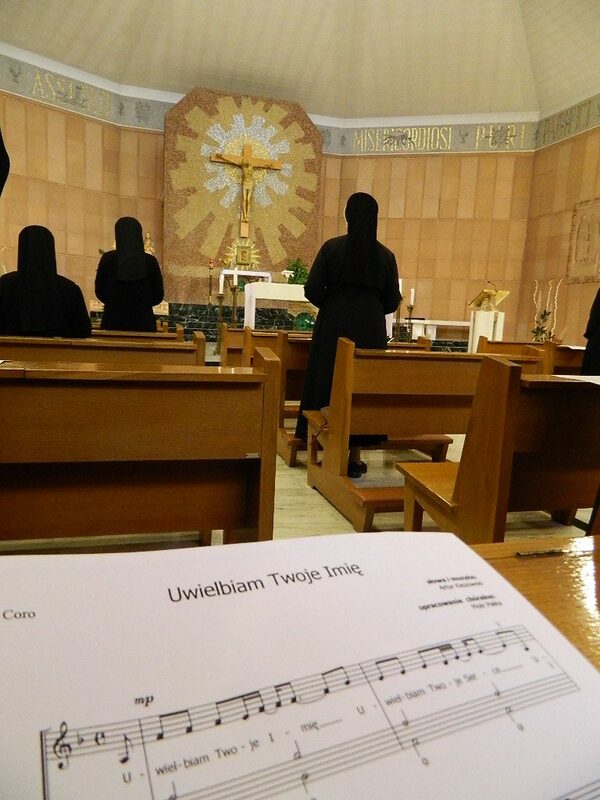 The silence and reverent atmosphere in the hall during the presentation were signs that all were touched by the performance. 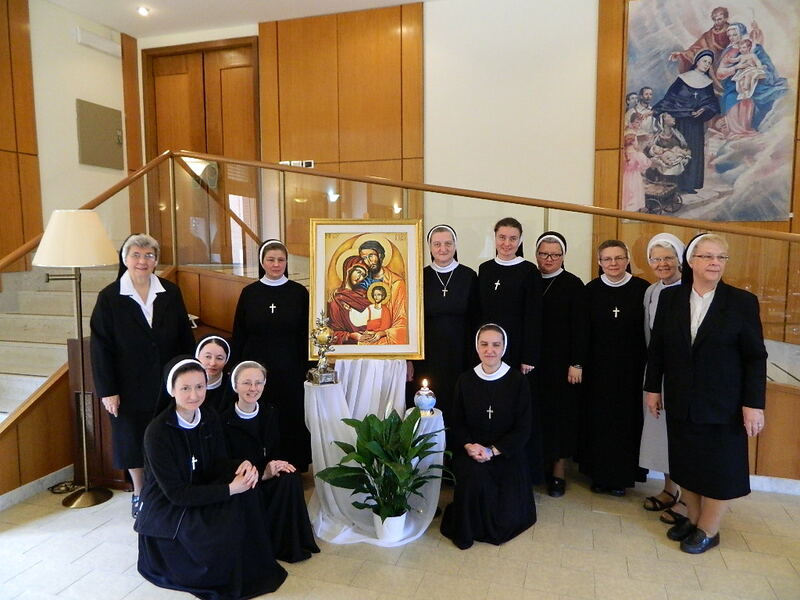 May the example and spirit of our Blessed Martyred Sisters continue to light our path and inspire us to generously live our consecration each day. 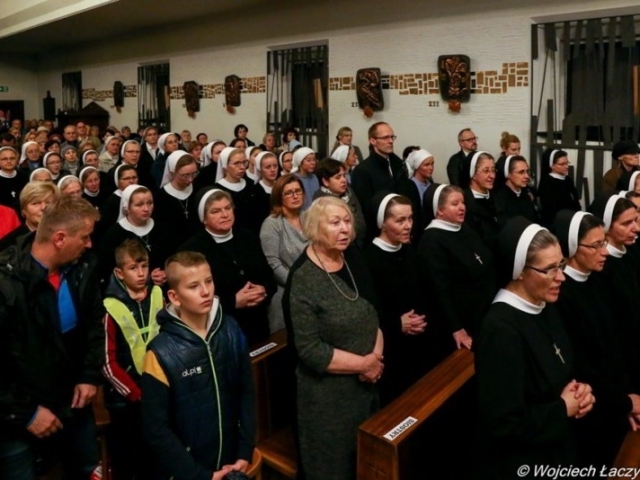 On Sunday, November 4, 2018, in the parish of St. King Stephen, Sisters from the Holy Name of Jesus Province began the celebration of the 100th anniversary of their ministry in Warsaw. Card. 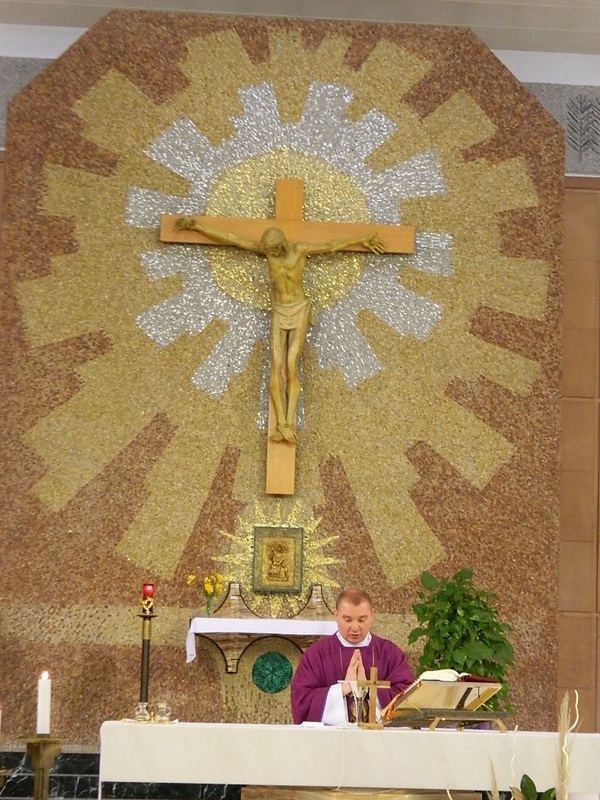 Kazimierz Nycz, Metropolitan of the Archdiocese of Warsaw celebrated the Mass and gave the homily. 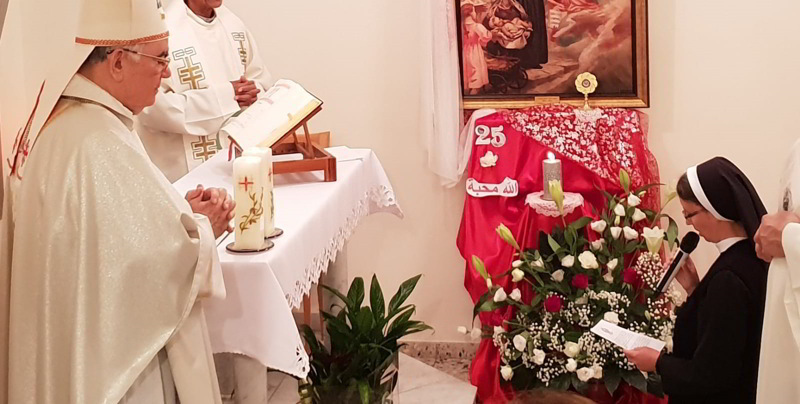 Many people took part in the celebrations: priests – former vicars of the local parish, diocesan and religious priests with whom the Sisters cooperate and who minister to them, Sisters from various congregations, parish council members, benefactors, school and convent employees, members of the Association of the Holy Family and the Nazareth Youth Ministry. 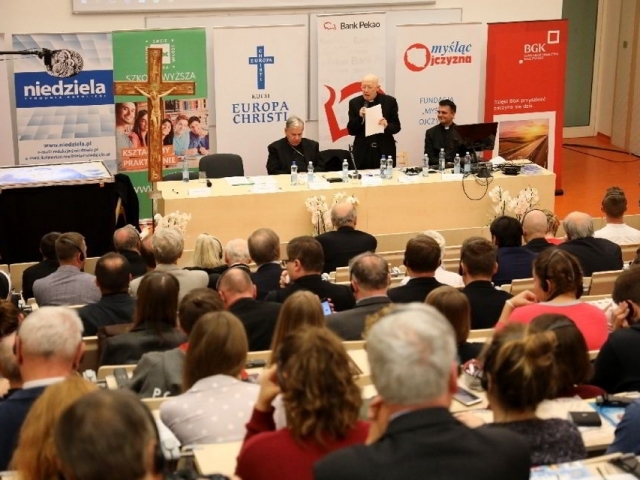 Representatives of the city authorities were also present, including the mayor of the Mokotów district – Bogdan Olesiński. On this special day, Sisters from various Provinces and from the Nazareth communities within Poland and from abroad came to Warsaw. 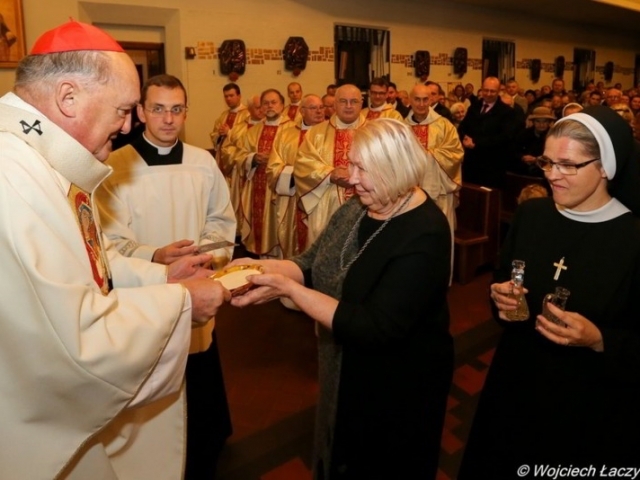 Among them was Sr. Halina Dołęga, General Councilor from Rome, representing Mother Jana Zawieja, General Superior. 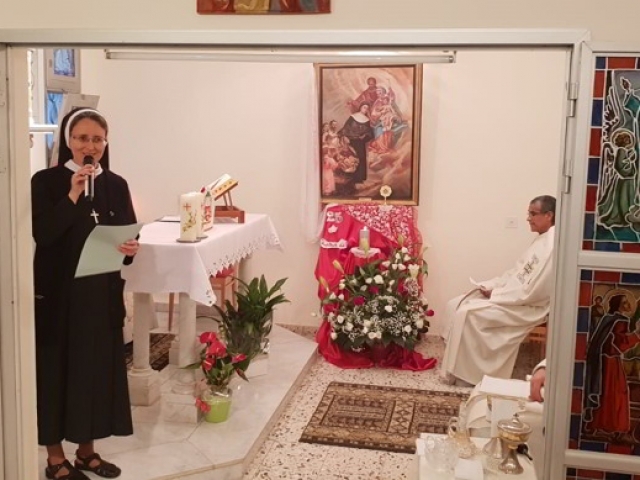 Sr. Teofania Migowska, Provincial Superior, in her words of welcome, invited everyone to pray together and give thanks to God for all the favors that were received by each of the Sisters from the moment she arrived in the capital in 1918 to the present day. 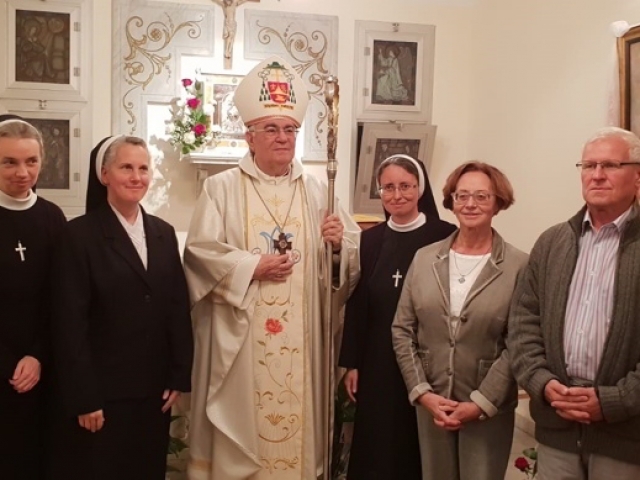 The House in Warsaw was founded by Mother General Lauretta Tekla Lubowidzka at the expressed desire of Pope Benedict XV. 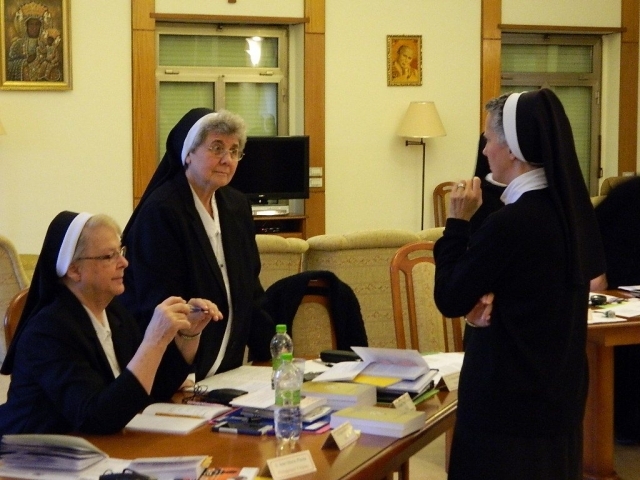 This occurred through the mediation of Fr. 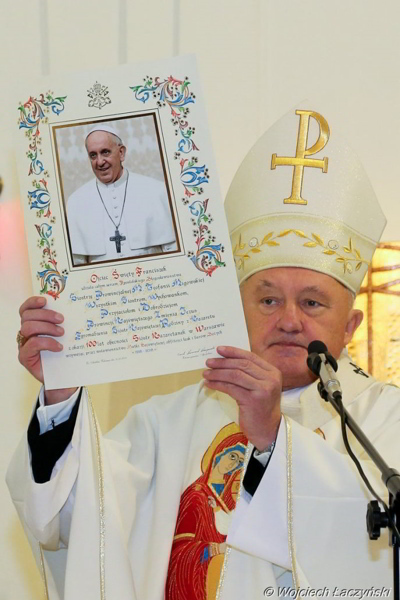 Henryk Przeździecki, who was in Rome during World War I and in 1916 became the delegate of the Polish Episcopate to the Holy See. 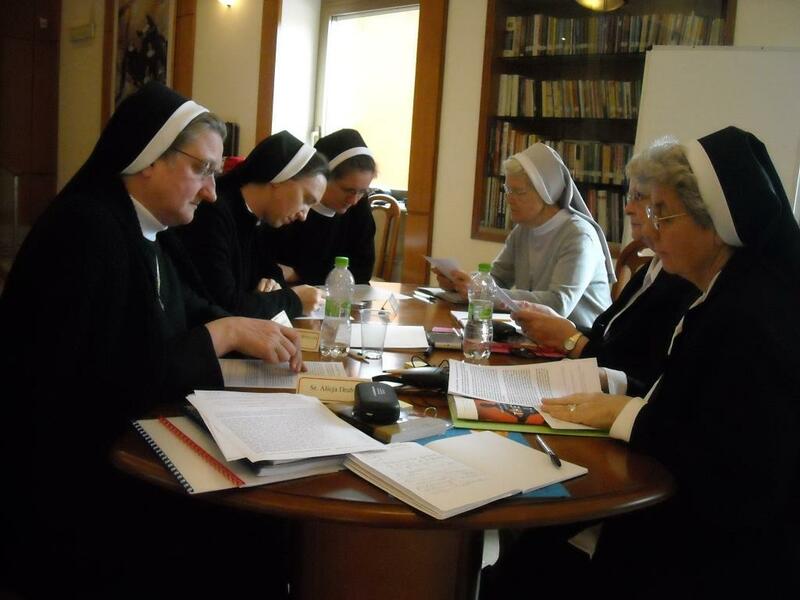 Nazareth Sisters arrived in Warsaw before the end of World War I. 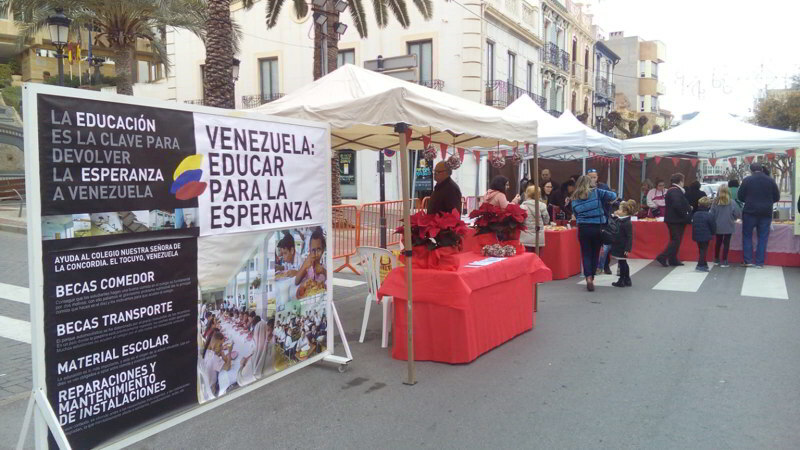 The press publicized this event. 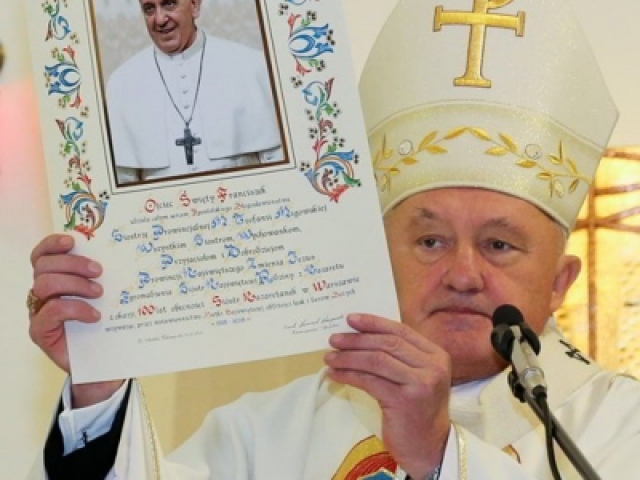 The Warsaw daily “Polak-Katolik” (Polish-Catholic) (No. 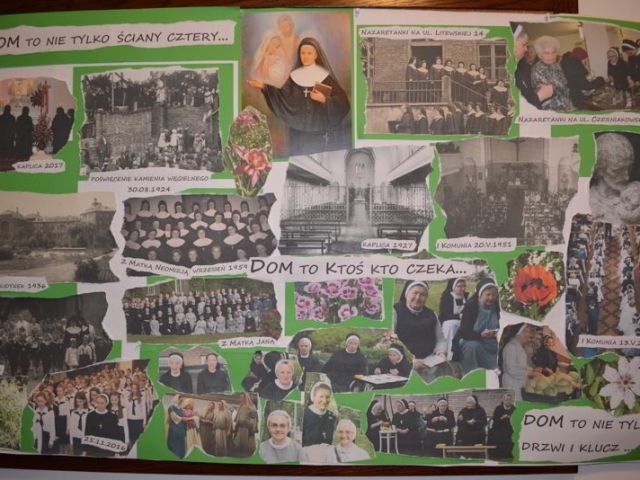 191) published a short article entitled “Nazareth Sisters in Warsaw”, in which they announced that on September 19, 1918, the Sisters had arrived in the capital and intended to open a hostel for students, followed by a middle school for girls and a dormitory at 16 Wilcza Street. 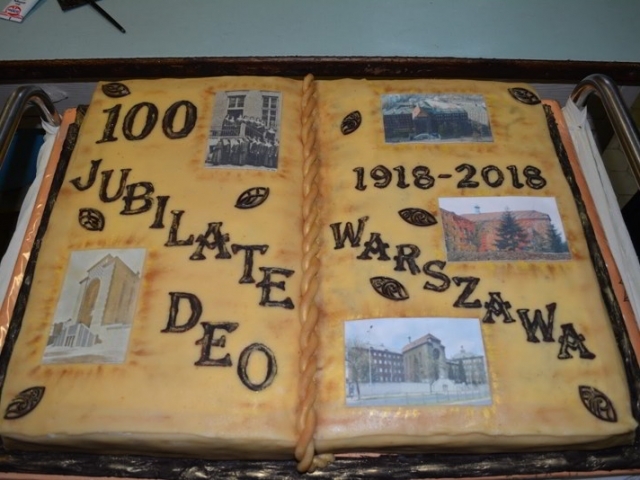 On November 5, 1918, Archbishop Aleksander Kakowski issued an erection document of the House of the Sisters in Warsaw at 16 Wilcza Street in which we read: I erect the religious house of the Congregation of the Holy Family of Nazareth on November 5, 1918. This is the official date of the beginning of the community. 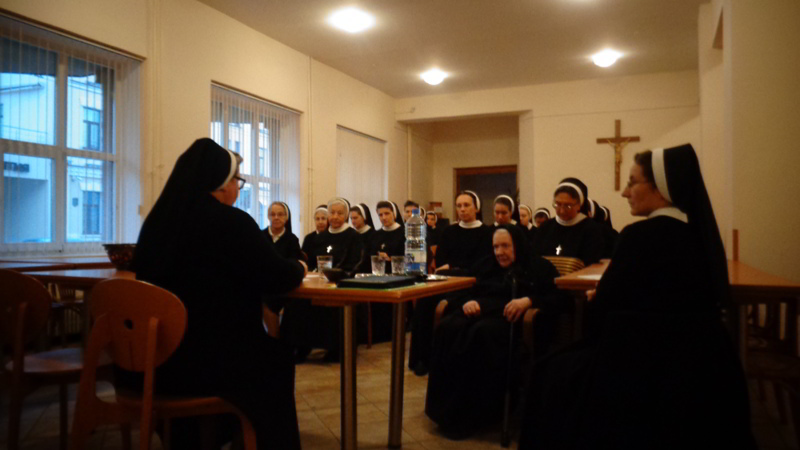 In the fall of 1919, the Sisters moved to the building at 14 Litewska Street. 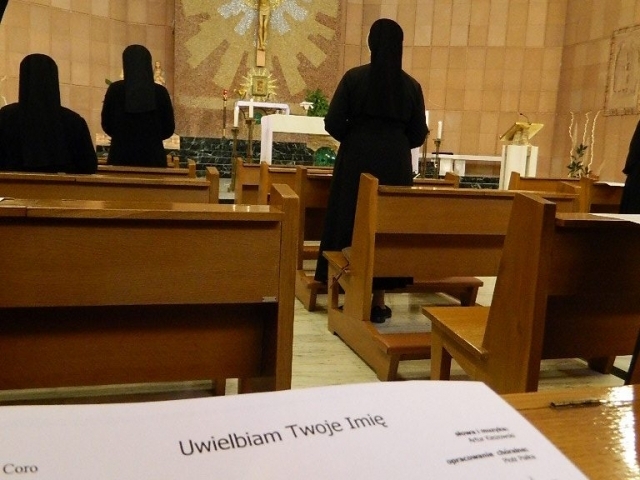 After a short time, when the number of students increased and there were no additional rooms, the Congregation decided to purchase land on the outskirts of Warsaw at Czerniakowska Street and to build the Educational Institute of the Congregation of the Sisters of the Holy Family of Nazareth. 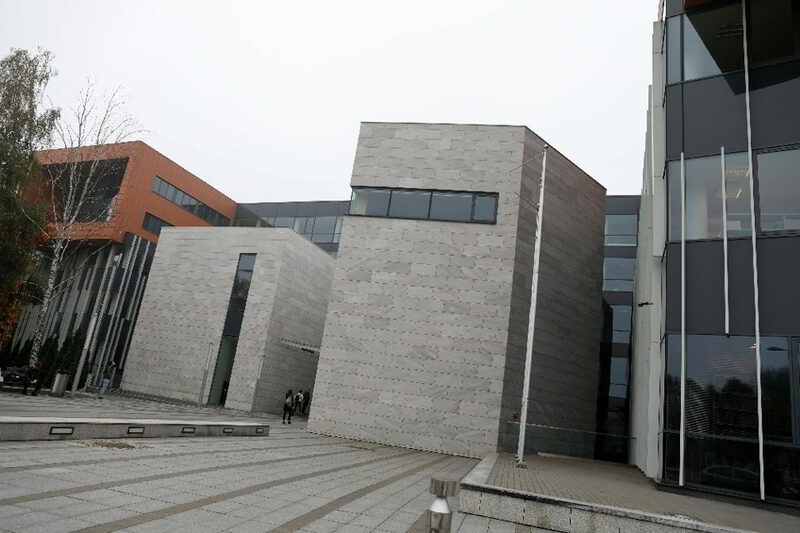 The construction of the building was undertaken by the Architectural Company of Karol Jankowski and Franciszek Lilpop. The original ornamentation and material – all these were innovations for the project. On August 30, 1924, when the foundations had risen above the ground, the ceremony of consecrating the cornerstone of the building took place. 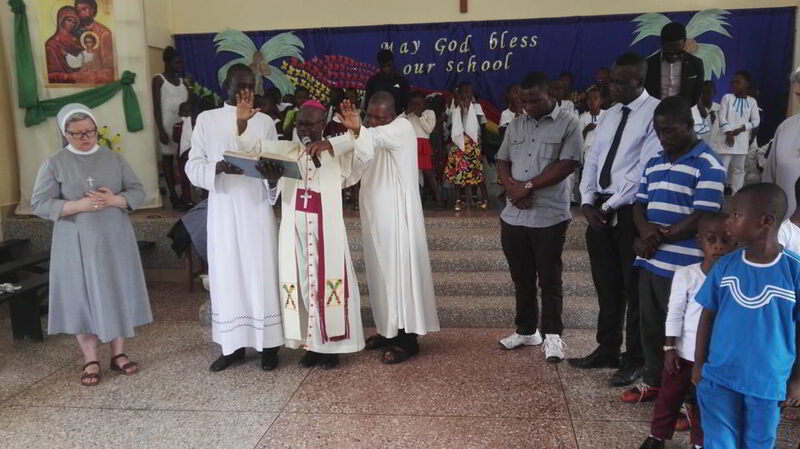 The blessing was done by Card. 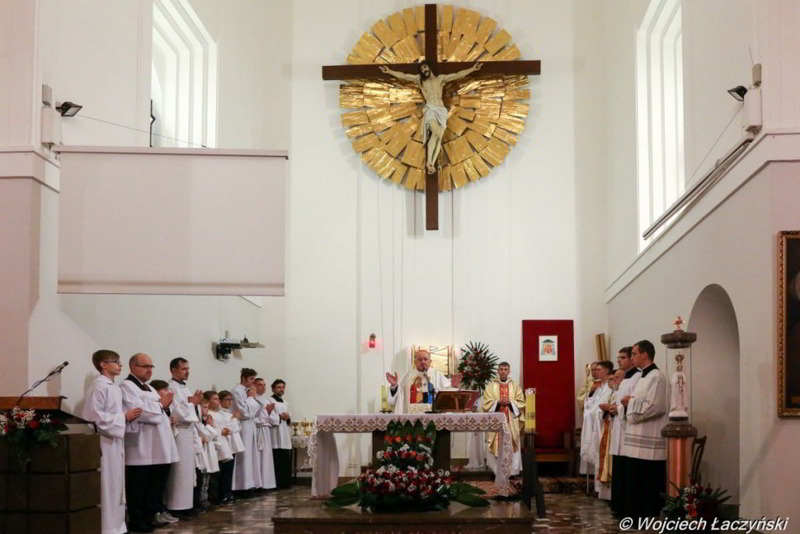 Aleksander Kakowski, assisted by several bishops, priests, parents of our students and residents of Czerniaków. The building was to include a large chapel, the Sisters’ private area and a boarding school. 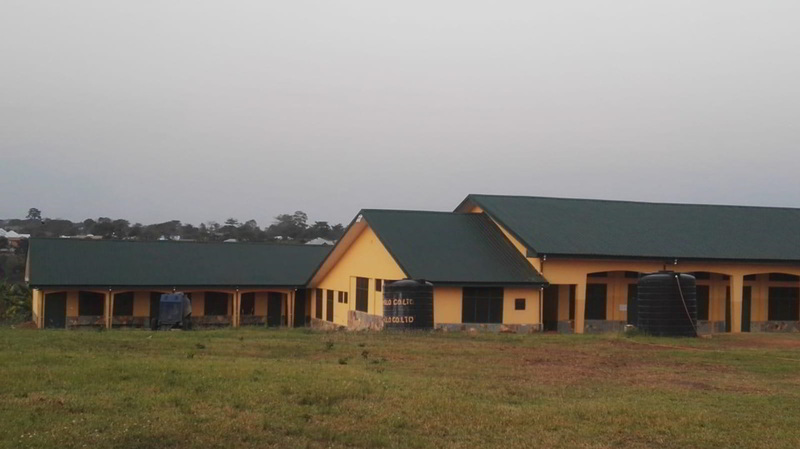 The project did not go quickly due to financial difficulties. In 1926 construction was stopped. The building already had a roof, but only one wing was finished, to which on July 7, 1926 students and Sisters moved from 14 Litewska St. 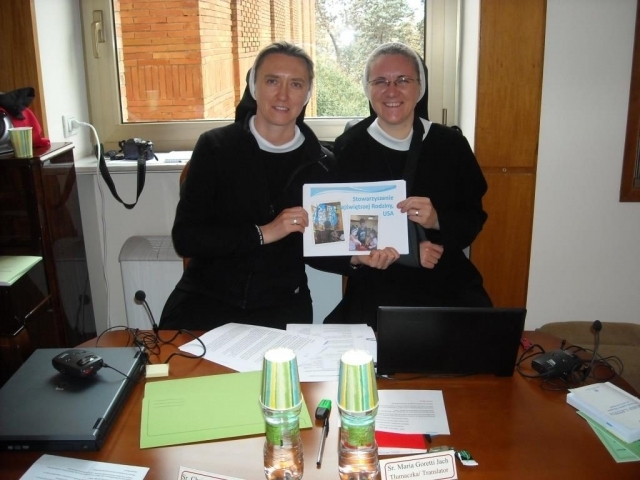 In order to obtain more funds, the Sisters went to the United States. 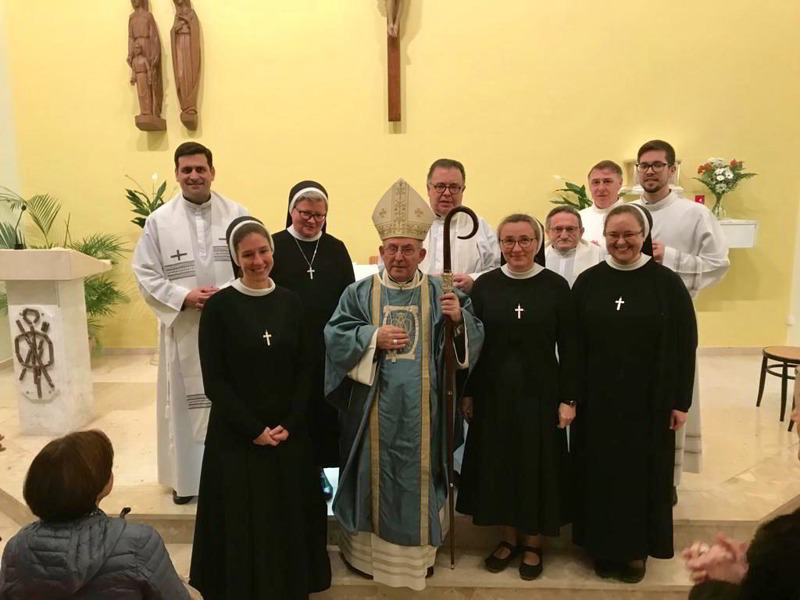 Thanks to the help of the faithful and the great sacrifices of the Sisters, both in Poland and in the United States, in January 1929, the chapel was dedicated under the patronage of Saint Joseph, the Spouse, by Bishop Antoni Szlagowski. The entire facility was ready for use in October 1936. 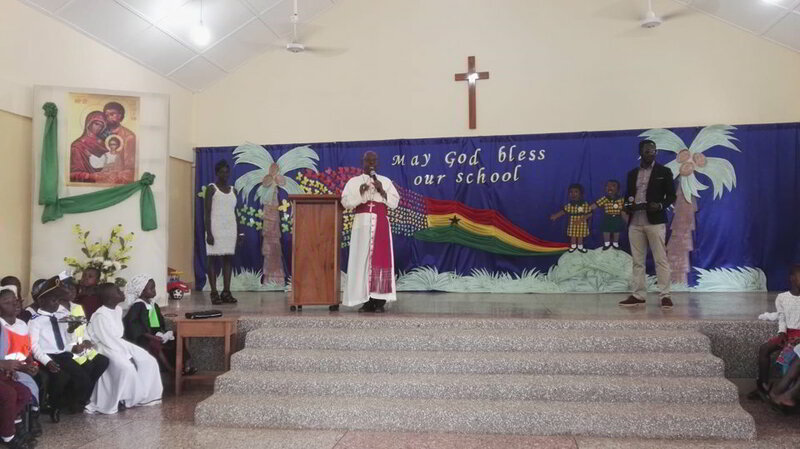 The school had the same rights as state schools and enjoyed the recognition of the authorities and society. 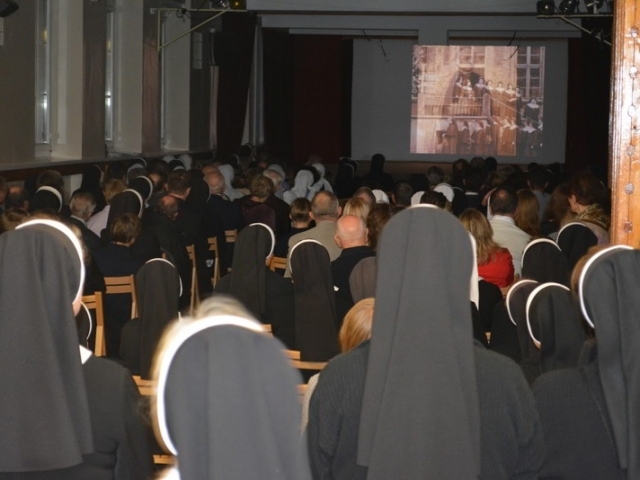 Already in the first days of the Nazi occupation in 1939, the city authorities occupied the school building and allocated it to the Central Welfare Council Center, in which 700 people lived until the outbreak of the uprising. 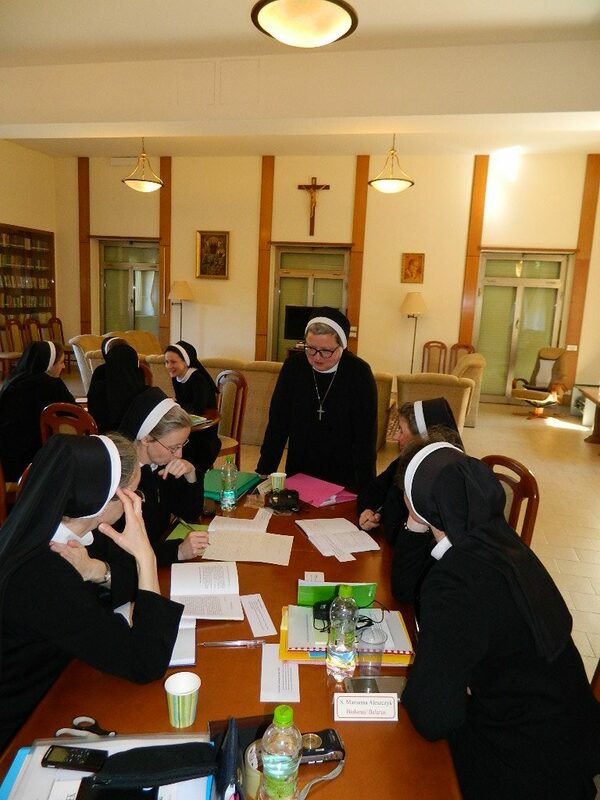 In some rooms of the dormitory, the Sisters opened a school – a middle school and a humanities high school, which was closed by the occupying government on November 15, 1939. 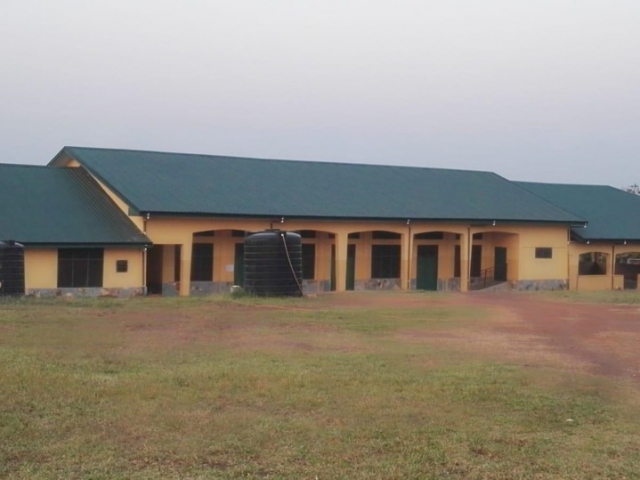 From that day on, only a general and vocational school could exist. 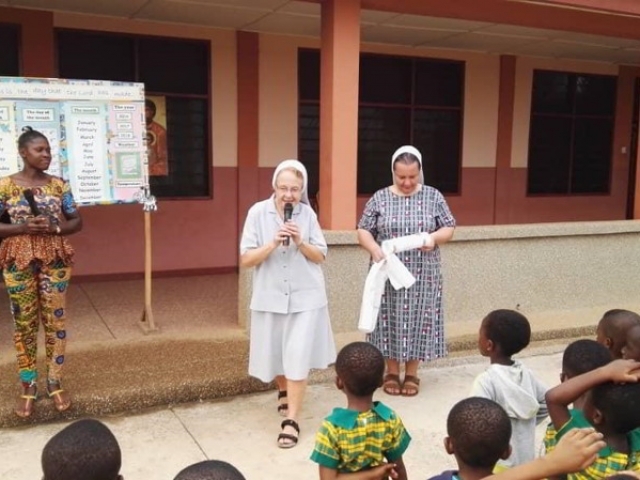 Under the signage of the general and tailors vocational school, the Sisters were secretly teaching middle and high school classes. 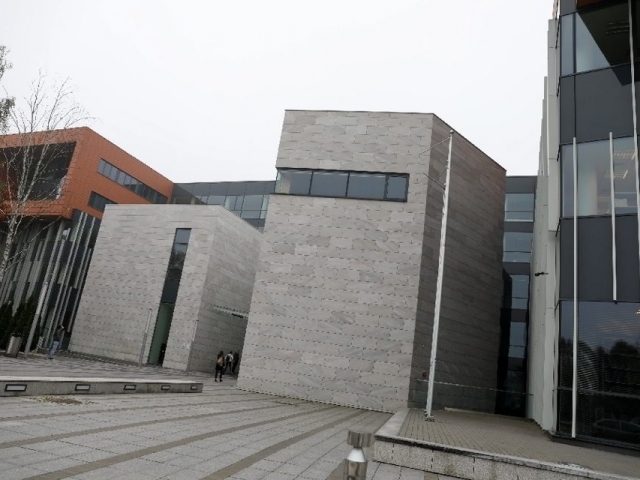 Five conspiratorial “matura” (final exams for graduation) took place in this building, and all together 115 students passed their matura exams. 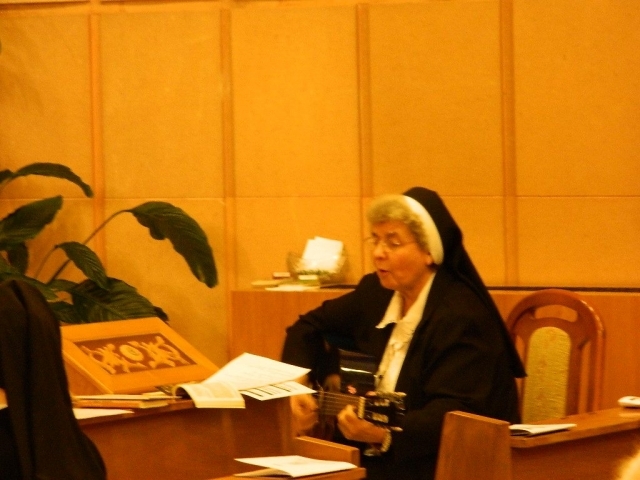 There were 130 female students in the primary school, middle school and high school, including nine girls of Jewish descent. 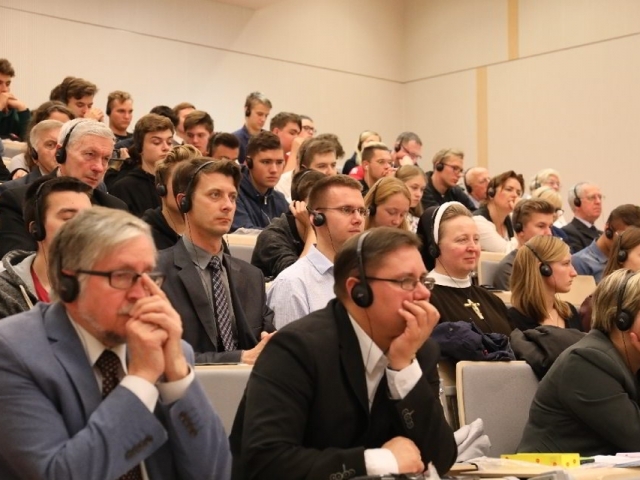 There were also secret lectures in classical philology at the University of Warsaw. In February 1944, the German authorities occupied a large part of the building and dedicated it to a Hungarian military hospital. 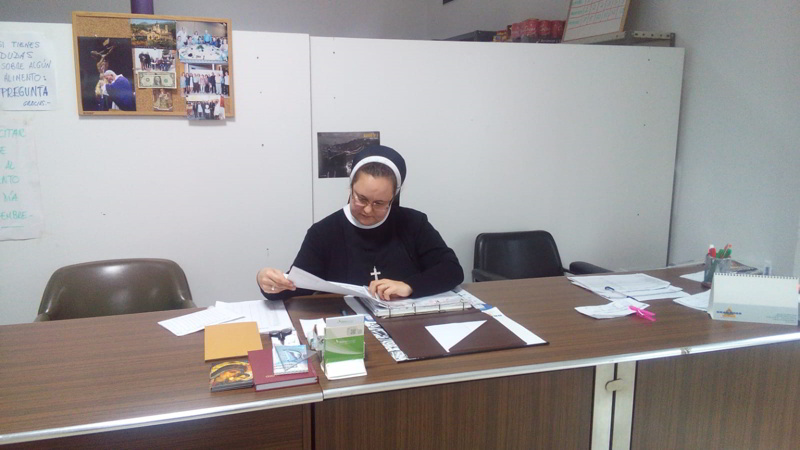 In June, the last transports of wounded Hungarians left our Nazareth building. The building also housed the Ujazdowski Hospital, which was removed by the Germans a few days after the outbreak of the Warsaw Uprising. 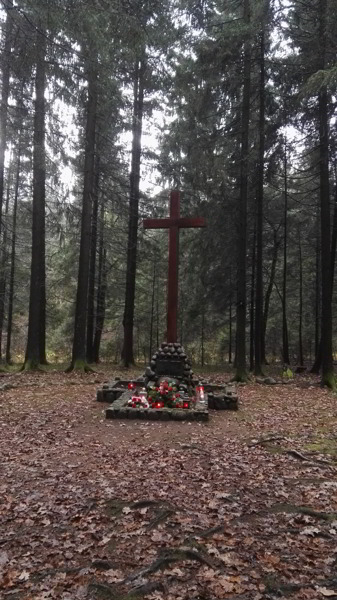 During the uprising, insurgent units stayed in the building and fights with the Germans were fought. In the gym, there was an insurgent hospital, and the insurgents were brought in through the church entrance. 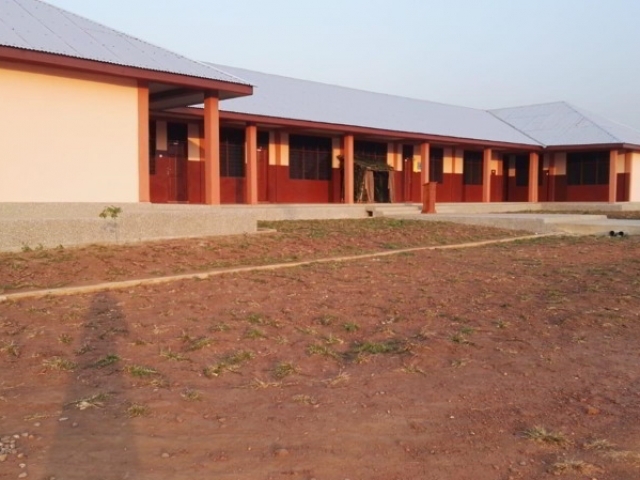 Children came to the school through tunnels, to breathe in the well-known walls for a moment. Fr. 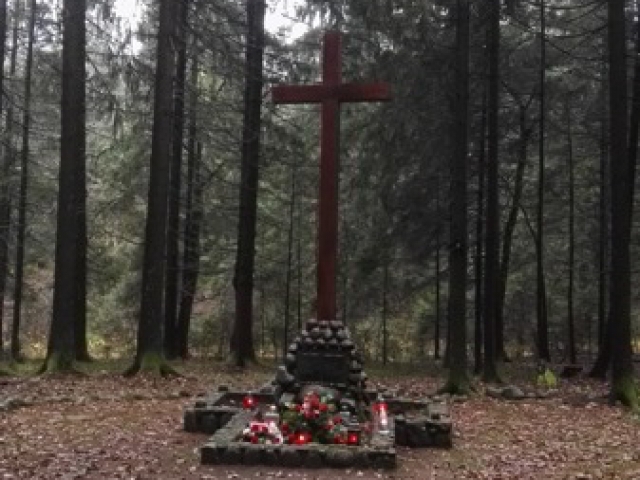 Walery Płoskiewicz heard the confession of and prepared for death those who had no chance of survival. 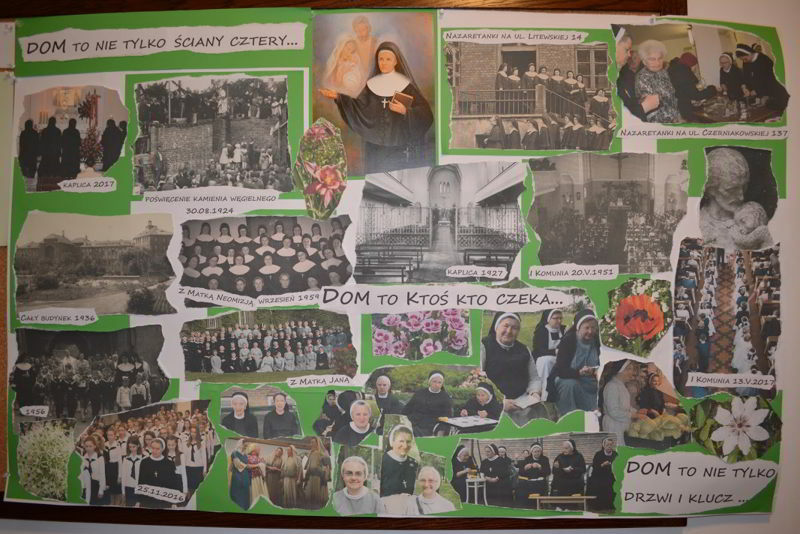 Before the Warsaw Uprising, there were 50 Sisters in the community, 25 sisters left the house before its fall and this group went to Okęcie. 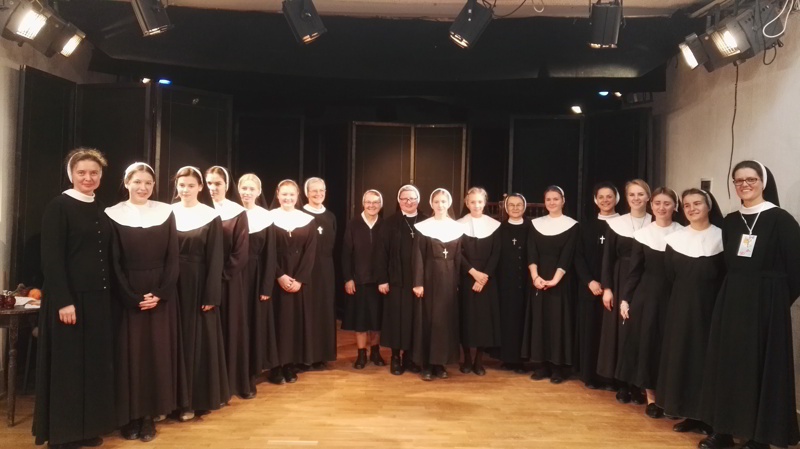 The second group of the Sisters, together with the Local Superior, Sister Eutalia Jadwiga Wismont, left the house after the failure of the uprising and headed towards Pęchiery, the third group stayed in villas near Karczew, along with the Novices and Novitiate Director, Sr. Ezekiel Szupenko, as well as the students. 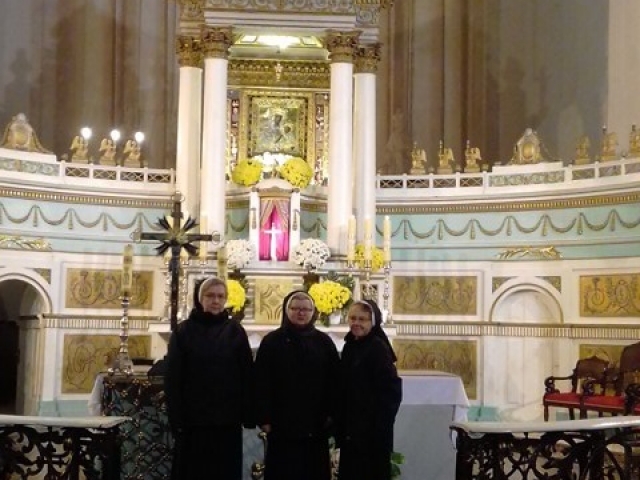 Already on January 20, 1945, two Sisters, Sr. Amabilis Filipowicz and Sr. Izabela Machowska, walked on foot from Śródborów to see if the house at Czerniakowska was still standing. Despite the huge damage, including several holes from artillery shells and a broken part of the roof, the building still towered over the destroyed Czerniaków. After the war, the house and school found themselves in the difficult communist reality. The building became the state-run public school no. 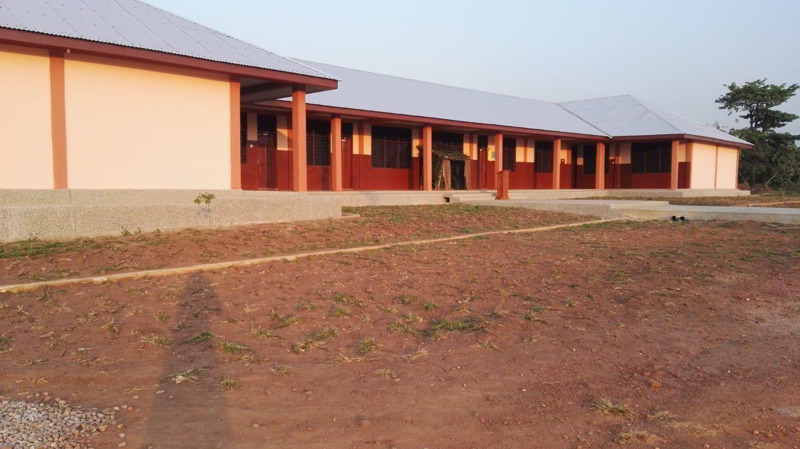 62, and then a mechanical technical school. 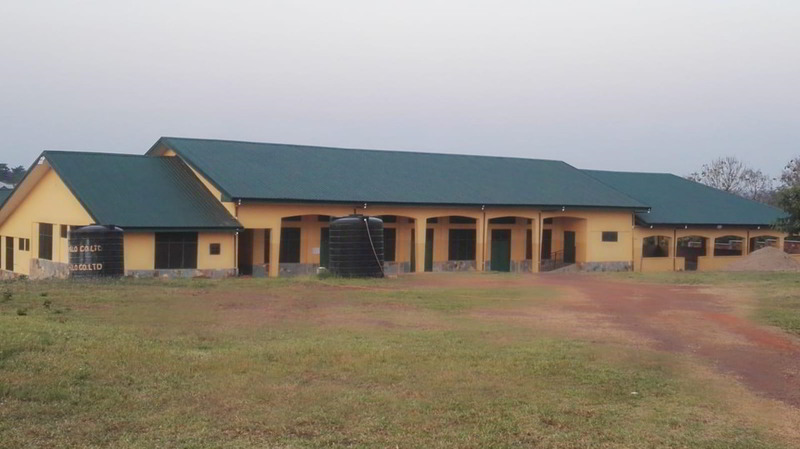 The third floor was left for the use of the Congregation; the Ministry of Health and Social Welfare took, by way of a lease, the 1st and 2nd floor for the Health Center. 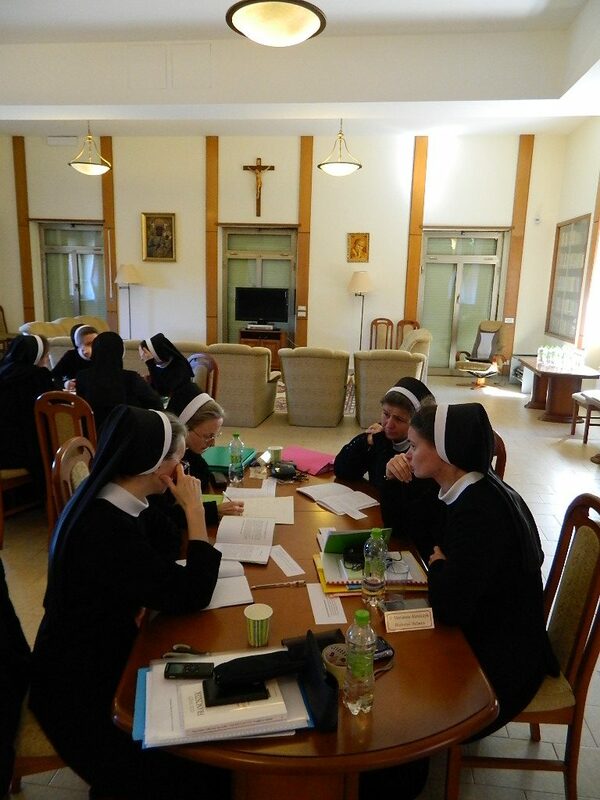 In this situation, the Sisters’ Private High School and the dormitory functioned in a very reduced space. In order to expand the space, the attic on the fifth floor and in the so-called “Ark” was used. 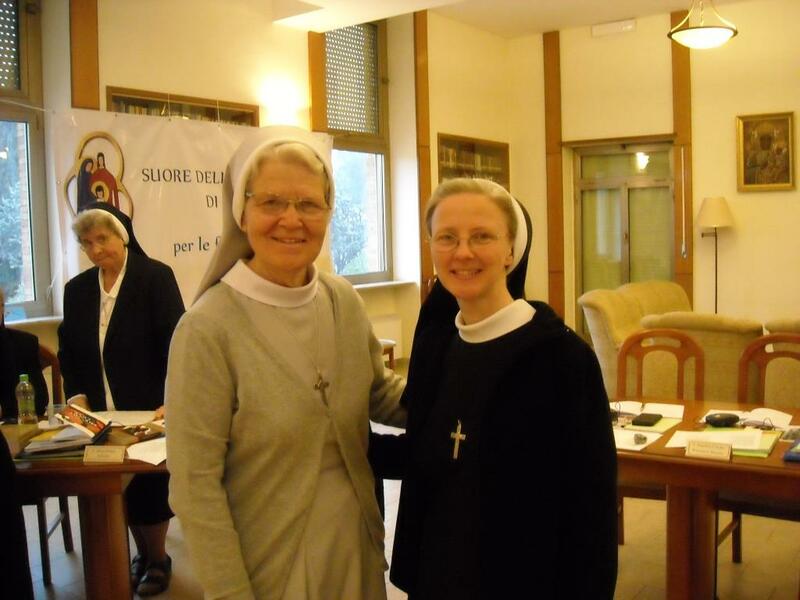 Right after the war, the Sisters opened a Caritas nursery and preschool at the request of the Episcopate. 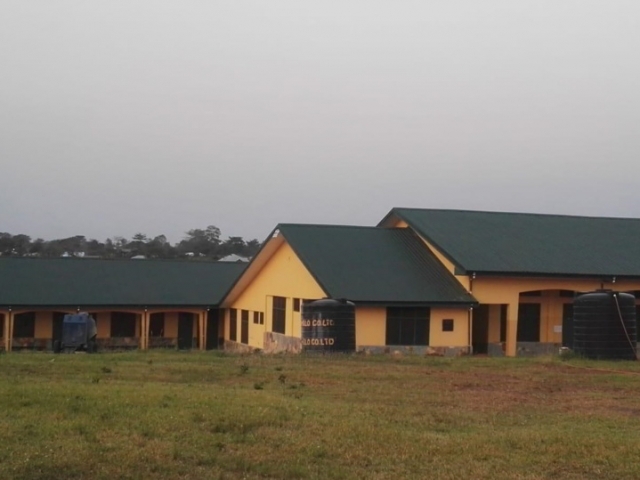 The nursery survived only one and a half years and the kindergarten until 1962. 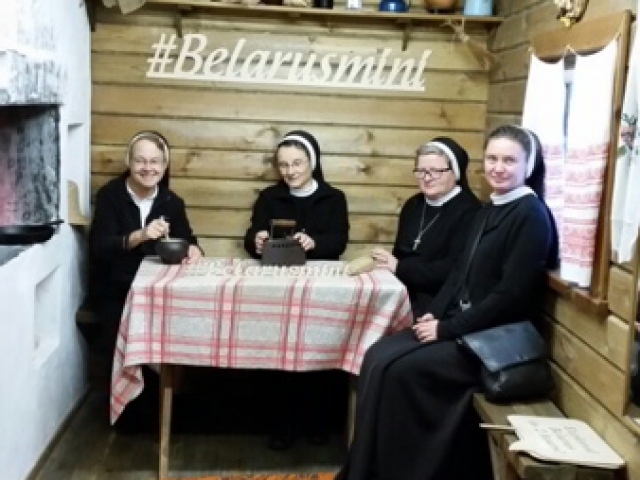 In addition, immediately after the war, from April 1945, the Sisters, on behalf of the District Welfare and Social Committee, led the district soup kitchen for the residents of Warsaw, distributing soup and bread for 1000 people a day. 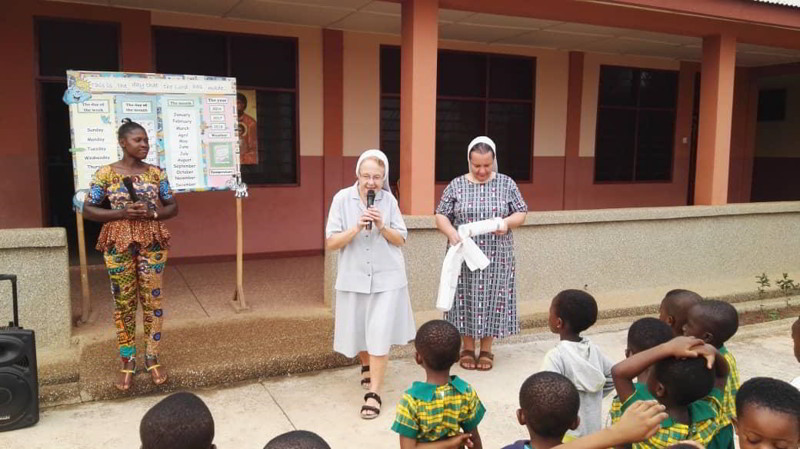 From 1946 to 1947, the Sisters ran a second kitchen for 600 undernourished neighborhood residents, mainly children. 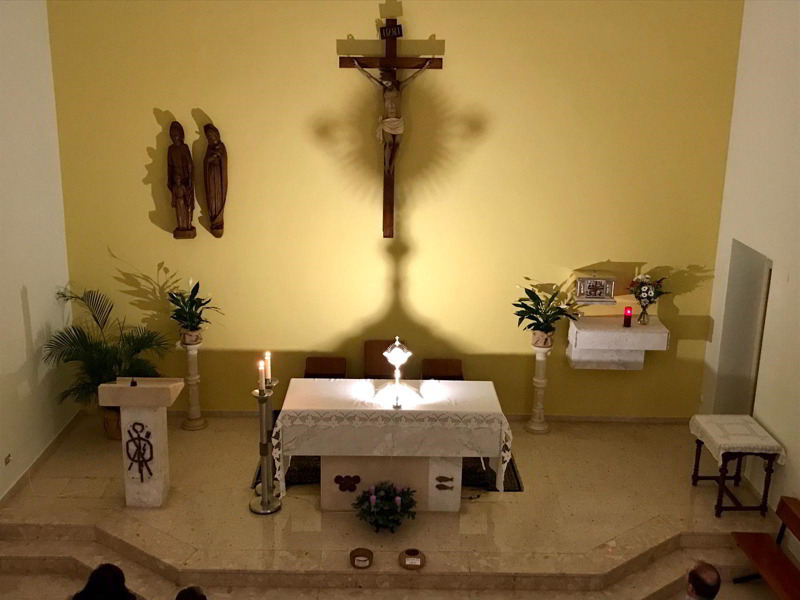 The chapel, whose original use was limited to the Sisters and the school and which had been devastated during the war, as a result of the lack of a church in the area became a public chapel, and later became the parish church. 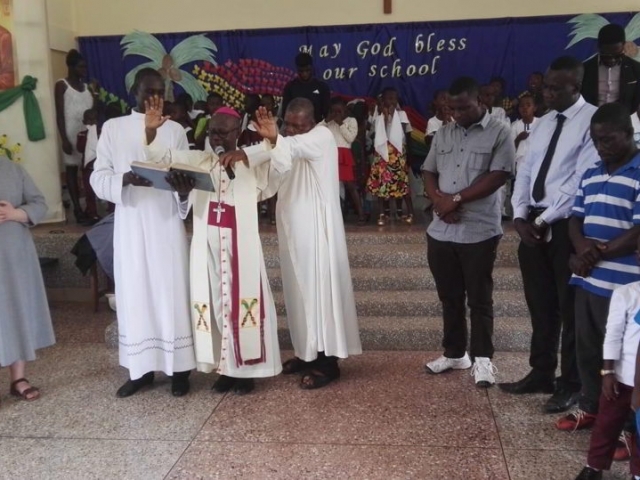 In 1963, the church became the rectorate with an independent priest. 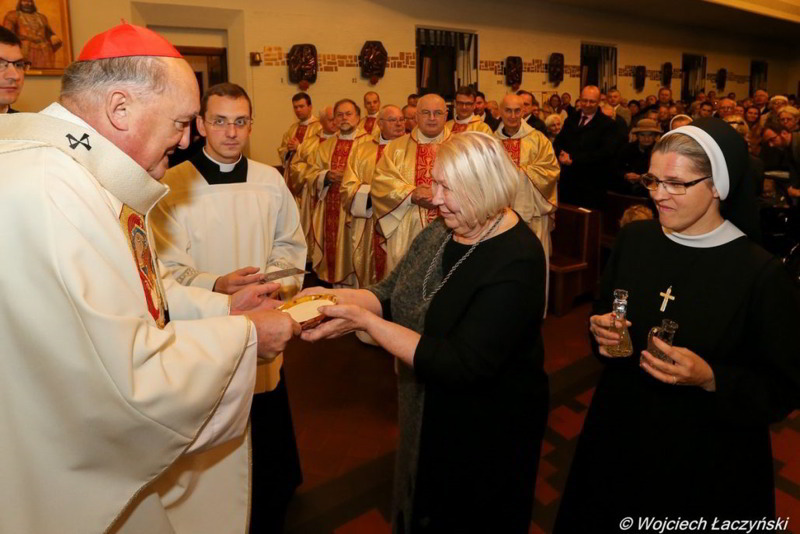 On March 1, 1973, by virtue of the decree of Archbishop Cardinal Stefan Wyszyński, the Primate of Poland, it was recognized as the parish of Saint King Stephen. In addition to the apostolates held up to this point, the Sisters were engaged in pastoral ministry in the parish. Major changes in the house took place after 1989. 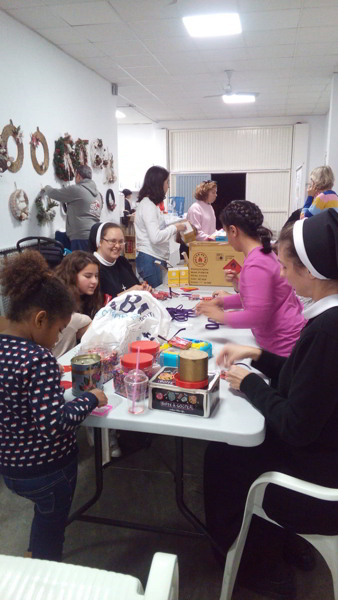 These were changes in both the premises – the successive giving back of the entire facility to the Sisters before summer of 1991, as well as personnel changes. 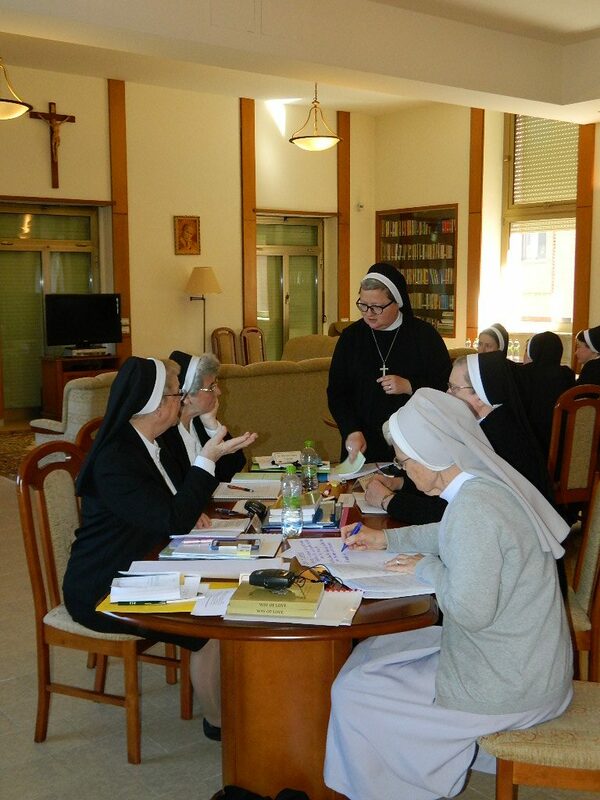 At that time, not only the space, the number of students and the number of Sisters working in the school, but also the need increased. 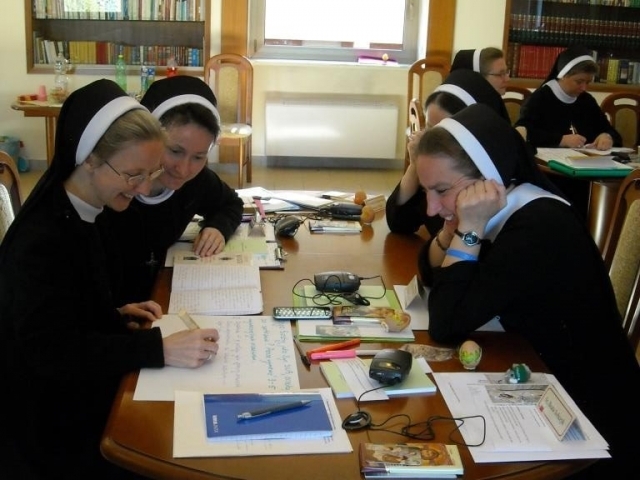 The fundamental change that took place in the structure of the Holy Name of Jesus Provincialate concerned the separation of a new, second community under the patronage of Jesus, the Master of Nazareth, with a consistent rhythm of work, combining the Sisters’ school duties with their religious life and prayer. 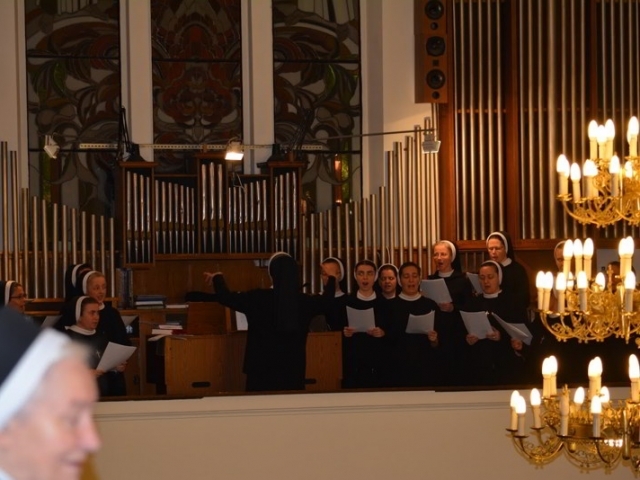 Since 1996, the magnificent gray brick building at 137 Czerniakowska Street has been hosting two Nazareth communities. 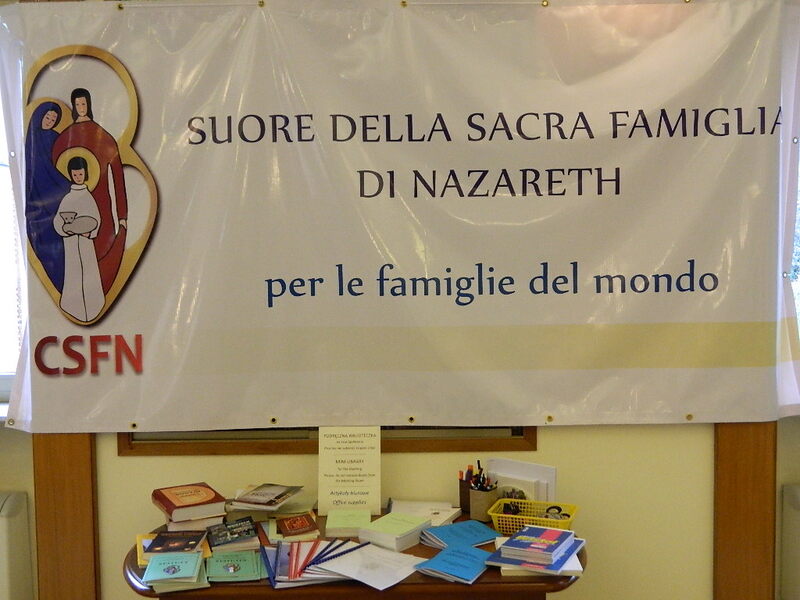 As Nazareth Sisters, following the example of their predecessors, the Sisters try to meet the needs of families. 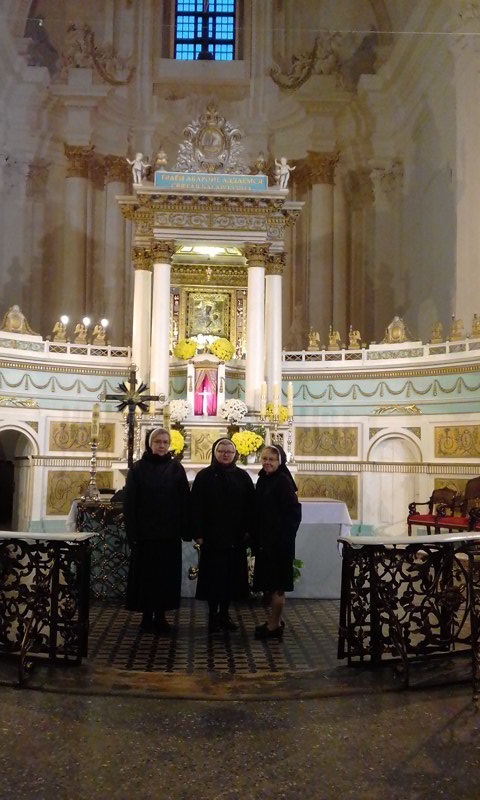 They have been running the school and dormitory since 1919, they are engaged in various services for the parish and the local area, and above all they pray for families every day, entrusting them to the Holy Family – Jesus, Mary and Joseph. 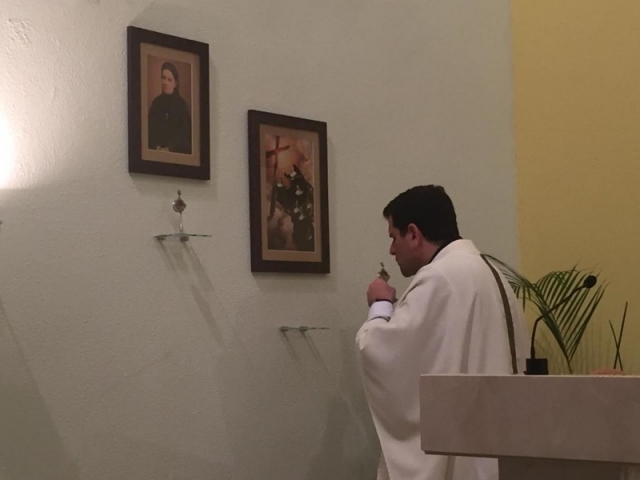 During the Jubilee Year from November 4, 2018 to November 4, 2019, a plenary indulgence can be received by visiting this parish church and fulfilling the usual conditions – sacramental confession, Holy Communion and prayer in the intention of the Holy Father. 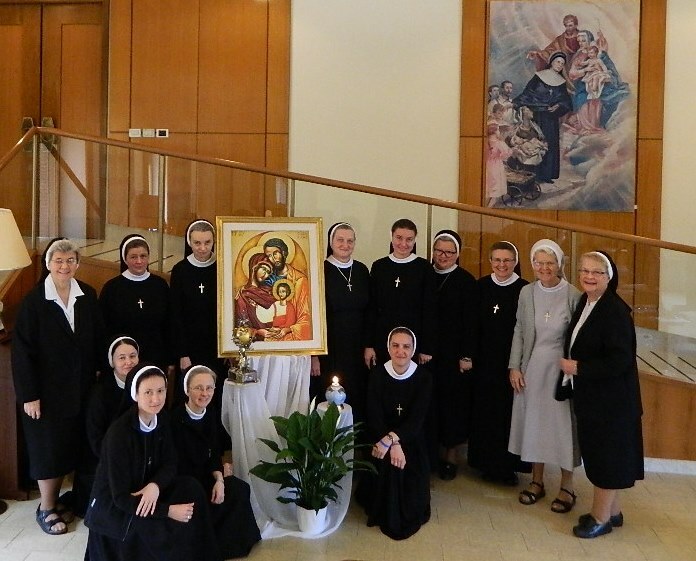 Feel invited: Sisters of the Holy Family of Nazareth, 137 Czerniakowska Street, Warsaw. 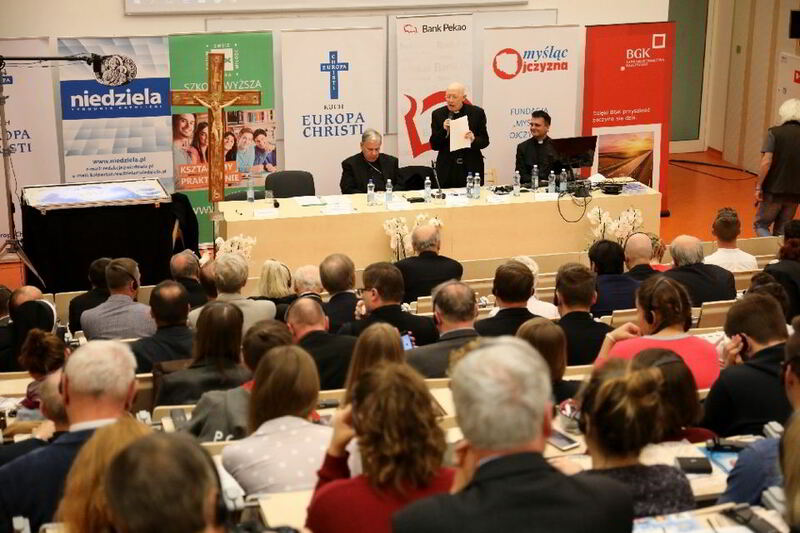 The 2nd International Congress of the Europa Christi Movement took place from October 14 to 22, 2018, in Poland. 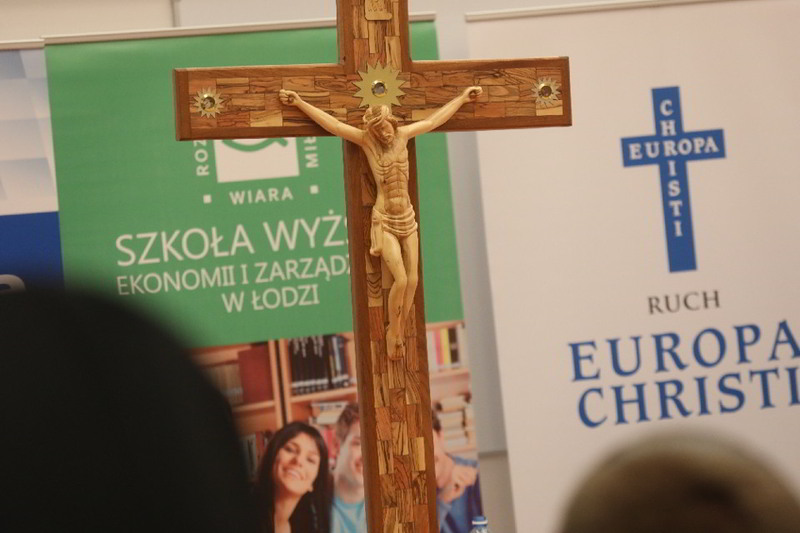 Individual sessions of the Congress took place in Częstochowa, Warsaw, Rzeszów, Lublin, Łódź and Kraków. 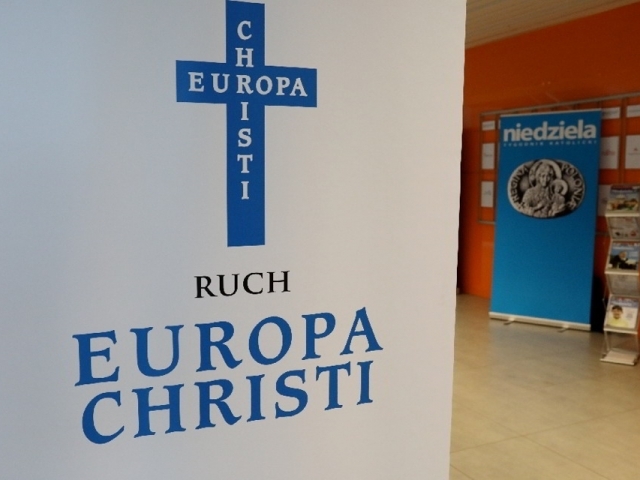 The Europa Christi movement aims to remind Europe of its Christian roots and the foundation of the moral values ​​upon which Europe was built. 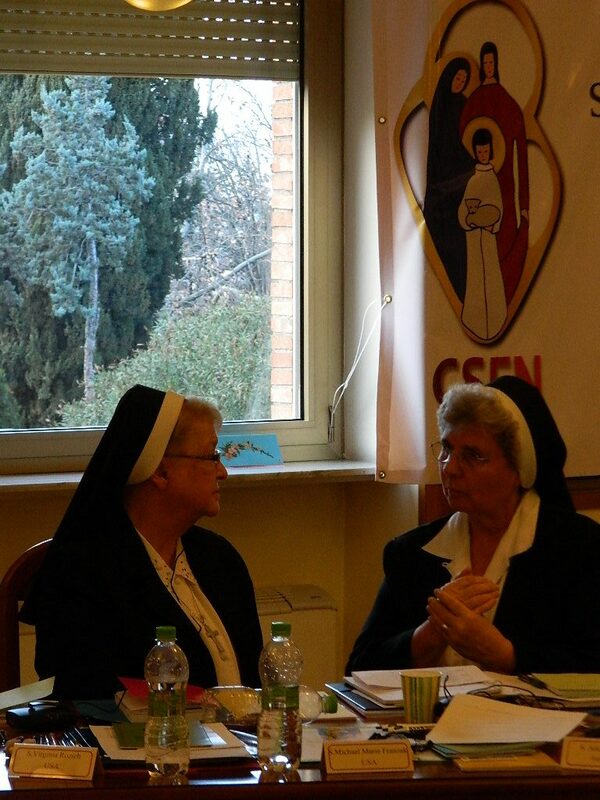 The Movement is decidely against the secularization of the Old Continent. 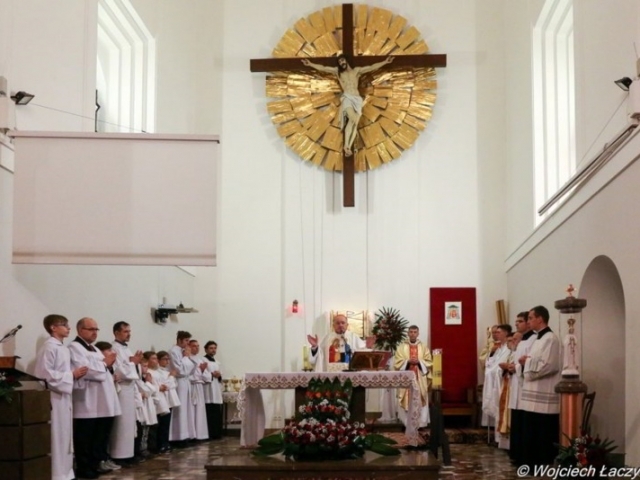 For if Europe loses its Christian identity, it threatens moral collapse and disaster for the whole world. 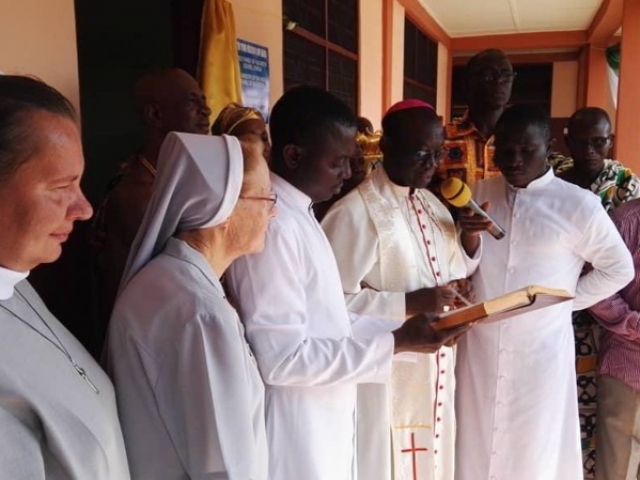 It is important to recognize that this is an ecumenical movement, open to the cooperation of Christians from the Protestant Churches as well as the Churches of the East. 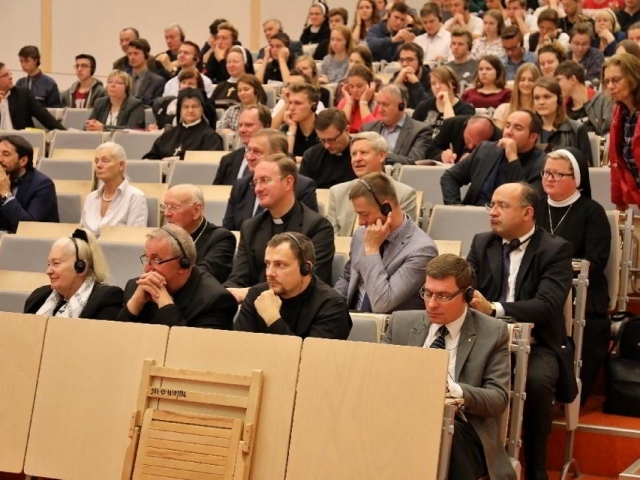 Each day of the Congress was devoted to a selected issue, which was presented in various ways by the many invited guests from Poland and around the world. 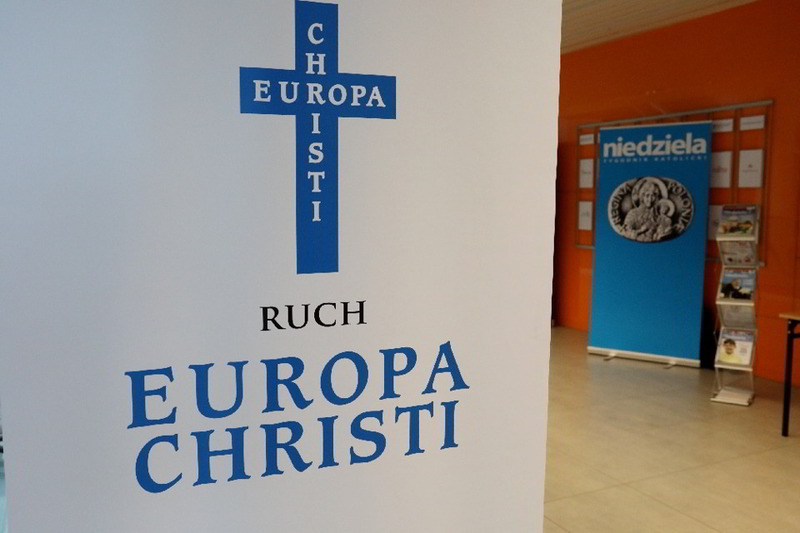 Our Congregation received an invitation to participate in a session entitled: The Europe of Martyrs. 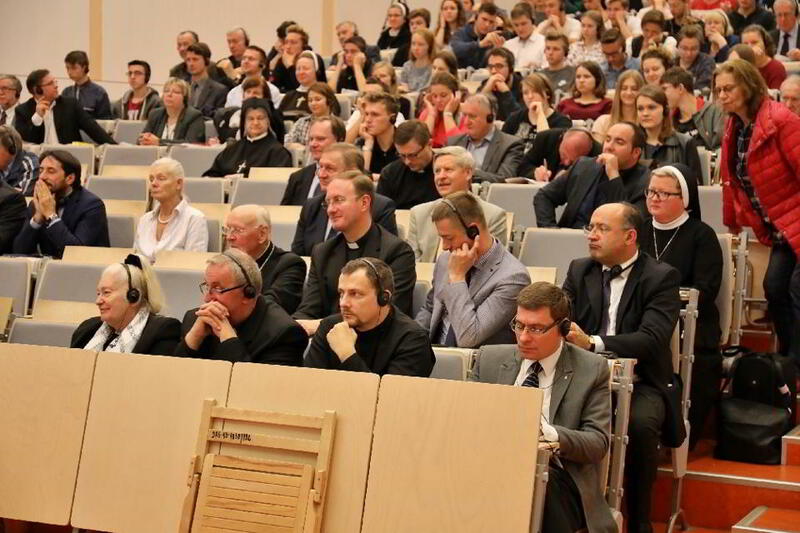 This session took place in Łódź, at the headquarters of the University of Lodz. It is worth emphasizing that it was October 19th, the liturgical memorial of the martyrdom of Blessed Fr. 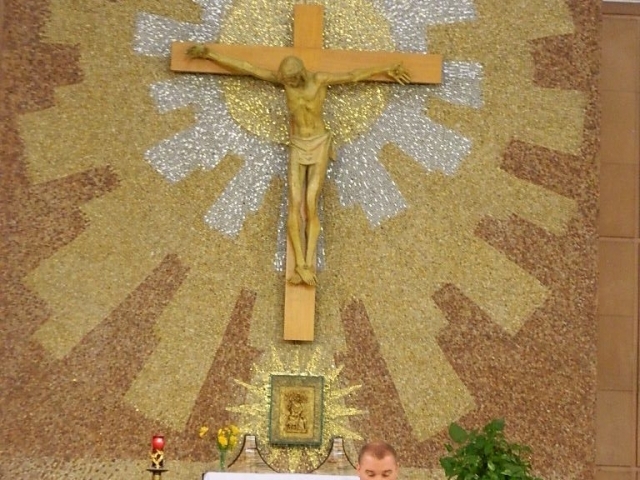 Jerzy Popiełuszko. His person, words and martyrdom were somehow a guide for us throughout the day. 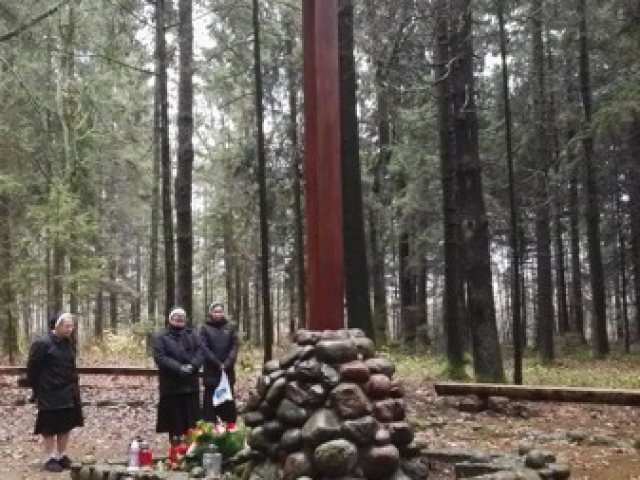 I was asked to present the story of our Blessed Martyred Sisters of Nowogródek and the message of their sacrifice. 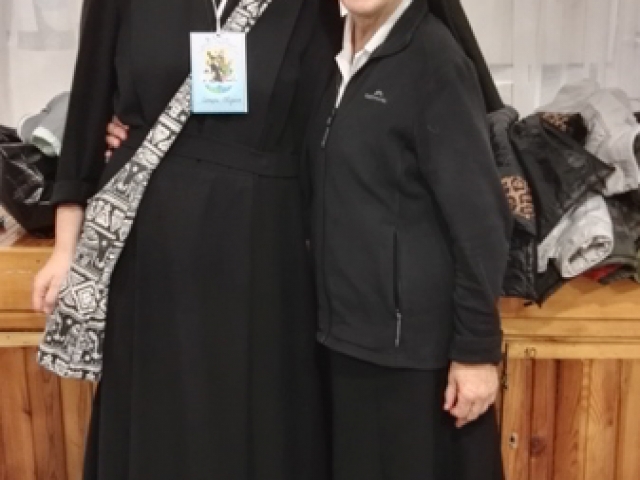 The Provincial Superior, Sister Teofania Migowska, from Warsaw and Sisters from the nearby community in Kolumna also came to the session. Therefore, there was an opportunity to distribute brochures about our Blessed Martyrs to the participants of the session. For most participants their story was not known (especially, for example, by our guests from Italy, Norway or Croatia). 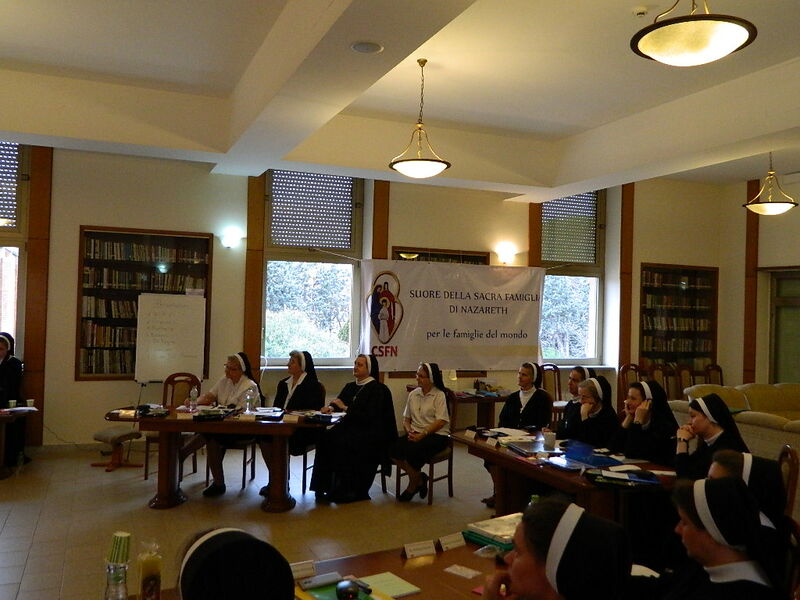 I was glad that my presentation met with great interest. Some even found it very touching. 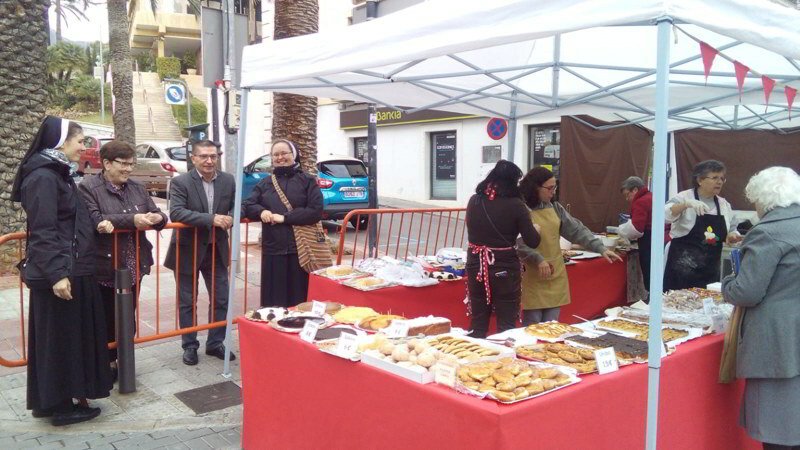 I trust that participation in this Congress may be another building block in spreading devotion to our Blesseds. The Sisters at the Generalate hosted an international meeting of the Sisters responsible for the Association of the Holy Family from 3-10 March, 2017. 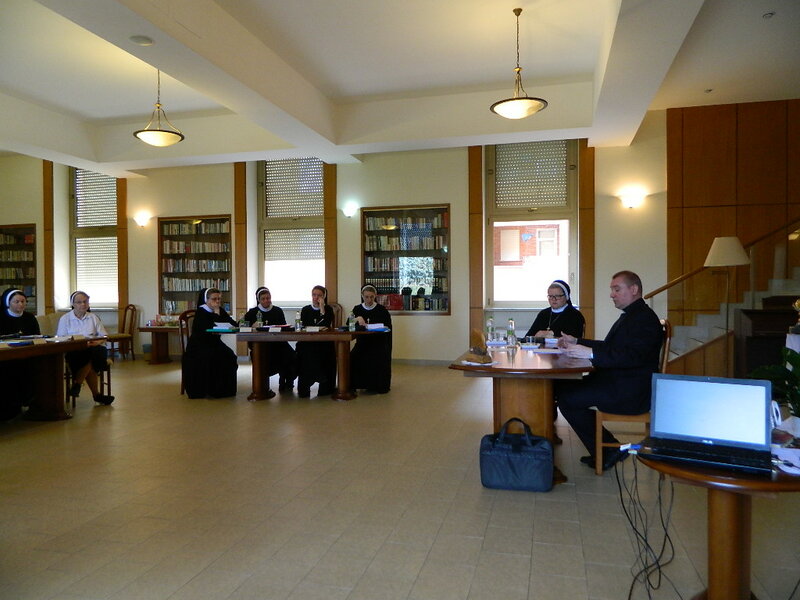 The meeting was attended by Sisters representing all seven Provinces of the Congregation and from the Ukraine Region. 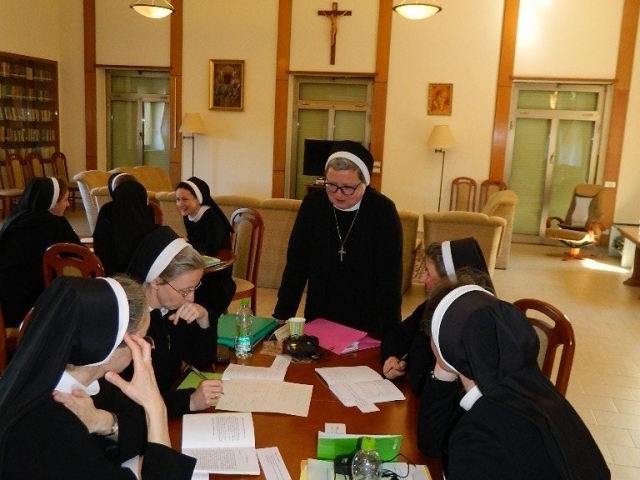 Mother Jana Zawieja, Superior General, presided over the meeting. 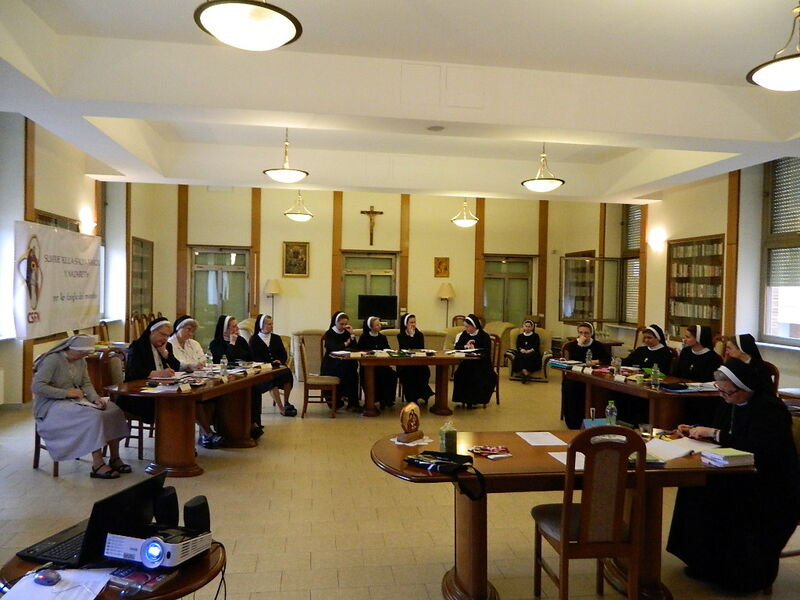 The aims of the meeting were to determine the current situation of the Association in the various provinces, review the Statutes and formation programs of the Association and above all to listen to the voice of the Church on the pastoral care of families today. 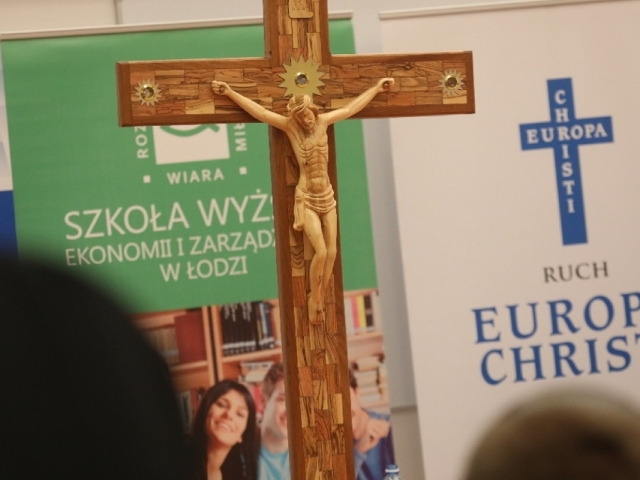 The introduction to the last issue took the form of three conferences presented by Father Dr.Jacek Golen, from the University of Lublin. 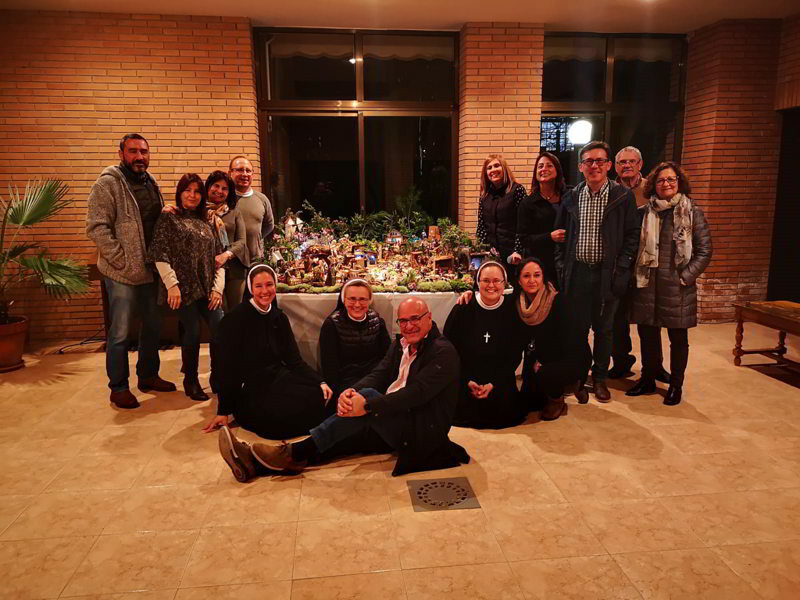 Father Golen spoke on the principles of accompaniment, and the directions and forms of renewal as ways of accompanying engaged couples, married couples and families in the light of the Exhortation Amoris laetitia. 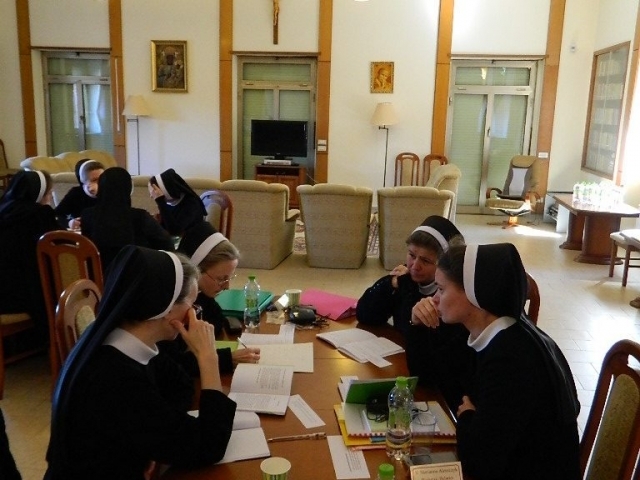 The topic of discernment was also very valuable from the point of view of personal formation as well as a means of helping those whom the Sisters who are accompanying, to discern the will of God. 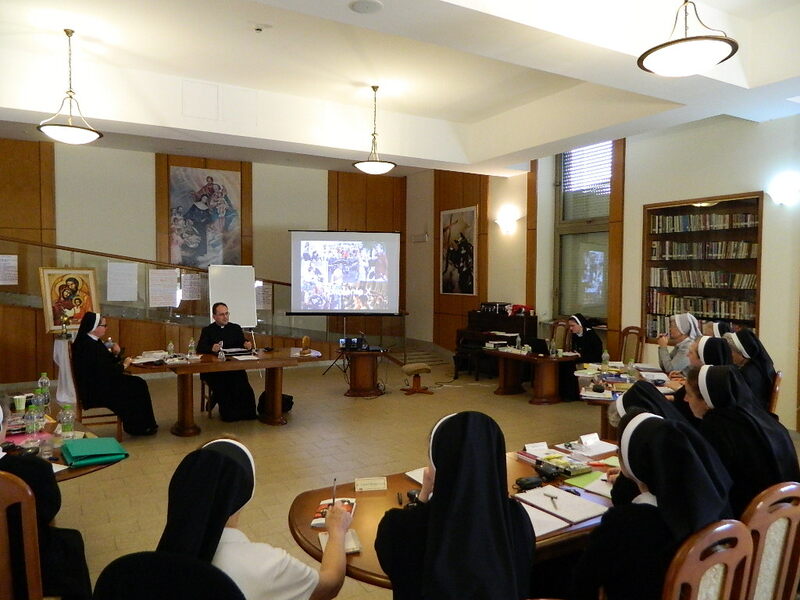 The second speaker, Father Dr. Albert Warso from the Congregation for the Doctrine of the Faith, addressed the topic concerning the accompaniment of the young as they prepare to those their vocation in life. 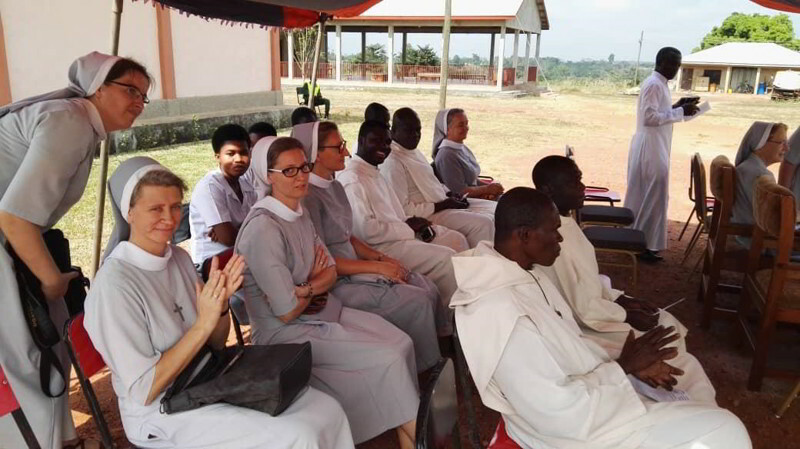 The participants also touched on the issues of formation for the Sisters and the involvement of lay persons in the pastoral care of families as well as the role of the Association in the implementation and continuation of the mission of the Congregation. The outcome of the week’s work resulted in the sharing of new ideas and concrete actions for better development of the Association and the appreciation of its role in the mission to families, engaged and married couples as well as those living in irregular family situations. 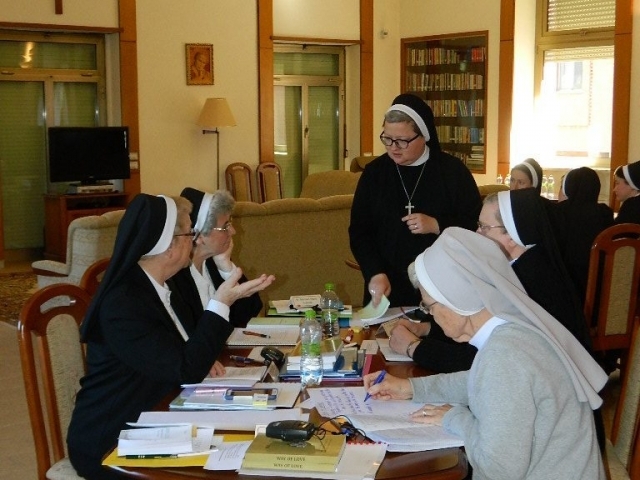 During the summary meeting the sisters expressed their gratitude for having the opportunity to better understand one other and the specifics of the Association in individual countries and the exchange of materials and methods of work. 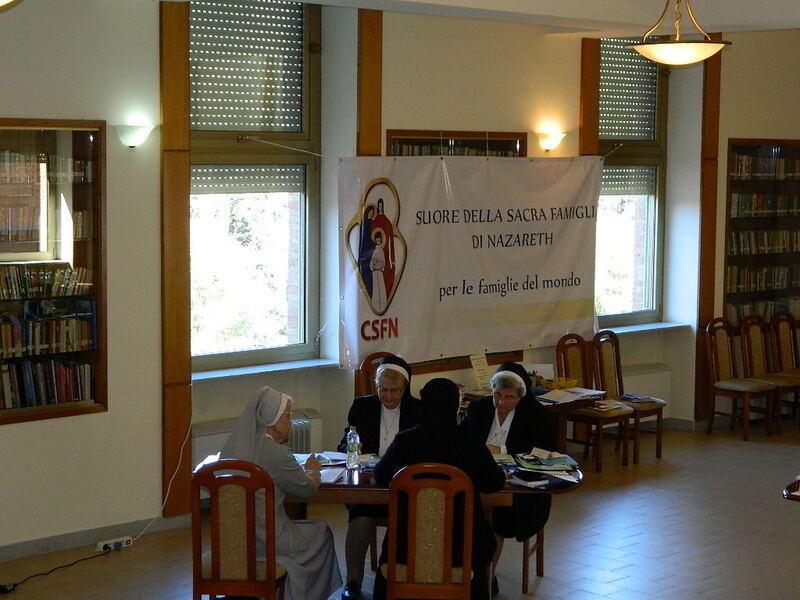 The Association of the Holy Family of the Congregation of the Sisters of the Holy Family of Nazareth is a practical expression of Blessed Frances Siedliska’s desire of including the laity in the Religious Congregation which she founded. 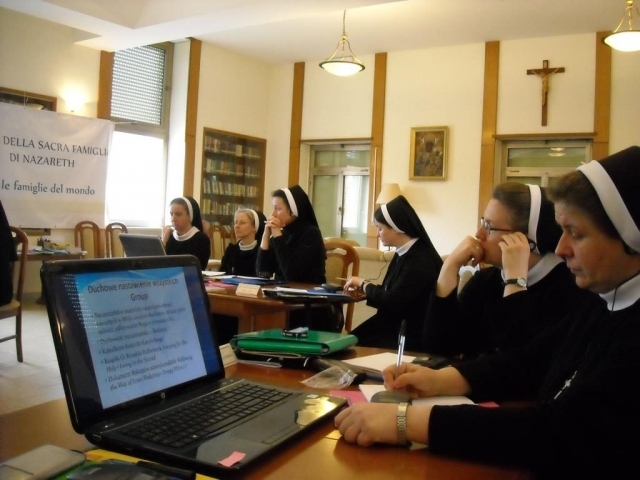 The first Statutes of the Association, called the Brotherhood of the Holy Family, were formulated during the life of the Foundress. 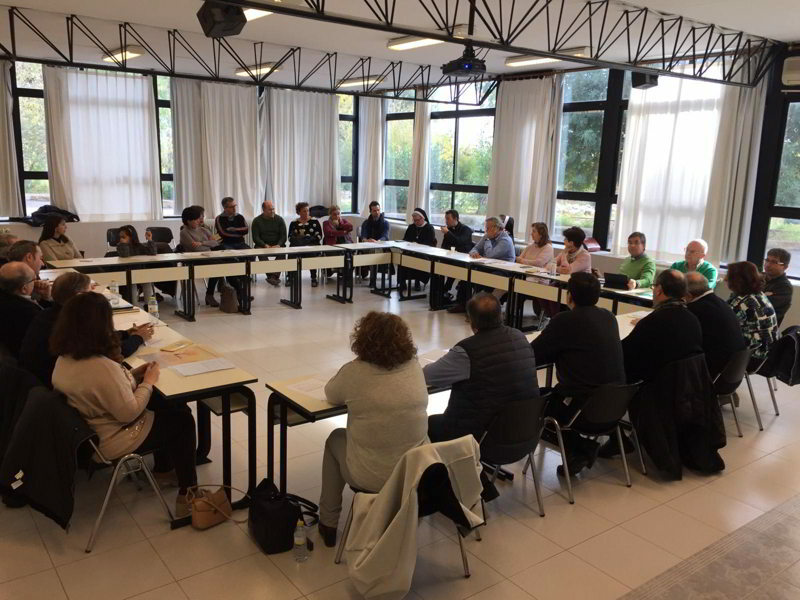 Members of the Association receive a solid formation and the possibility of sharing in the spirituality and apostolic mission of the Congregation. 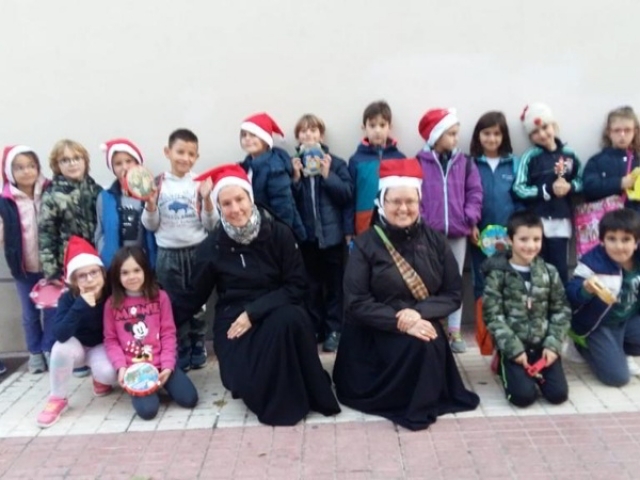 Through their efforts to live a life modelled on the example of the Holy Family they witness to Christian values in their family environment. 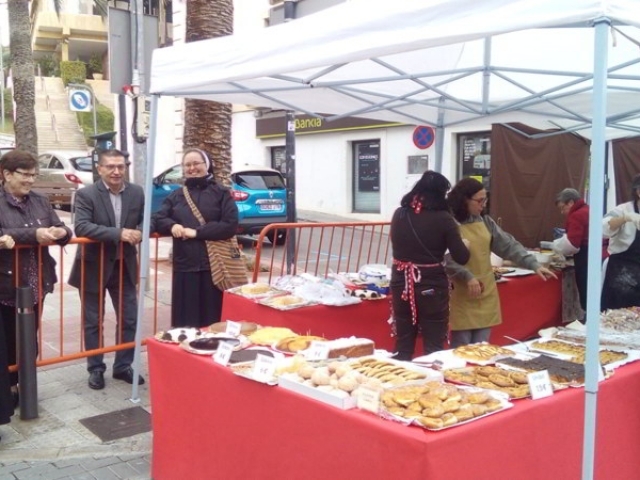 For the Congregation the association is a means for a more widespread presence in the world, especially among families. 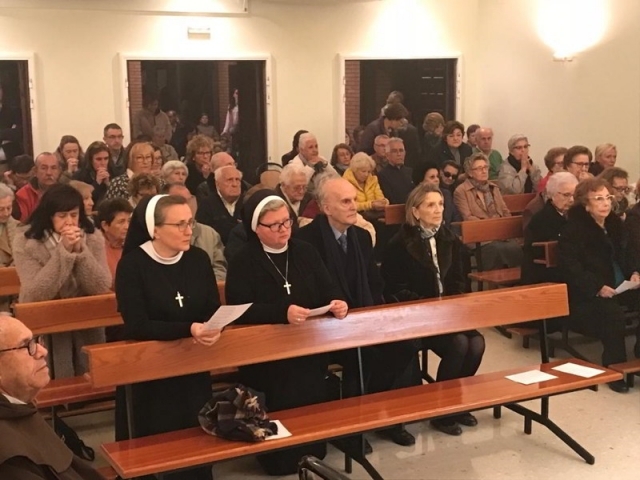 At the present time the Association numbers 880 permanent members and several hundred candidates and supporters, who meet in 53 formative groups. 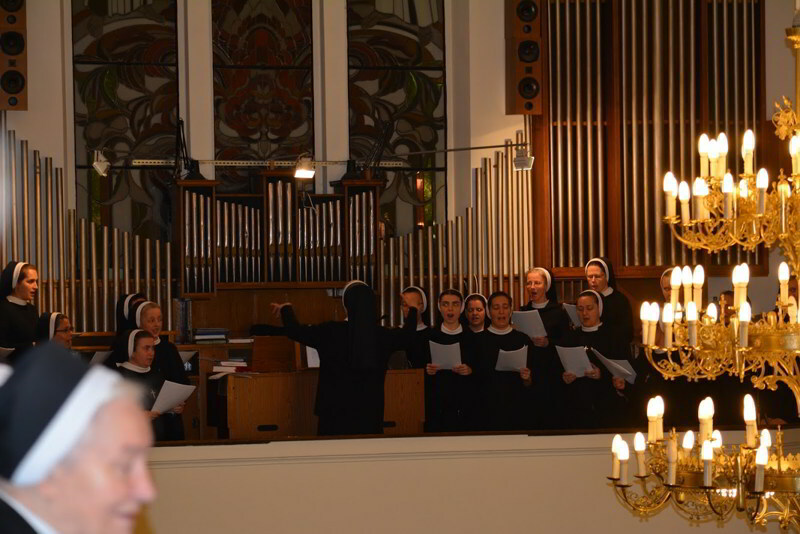 They are accompanied by over 60 Sisters. Increasingly, the experienced members are taking responsibility for the formation and apostolic activities of their groups. Copyright 2019 © CSFN. All rights reserved.